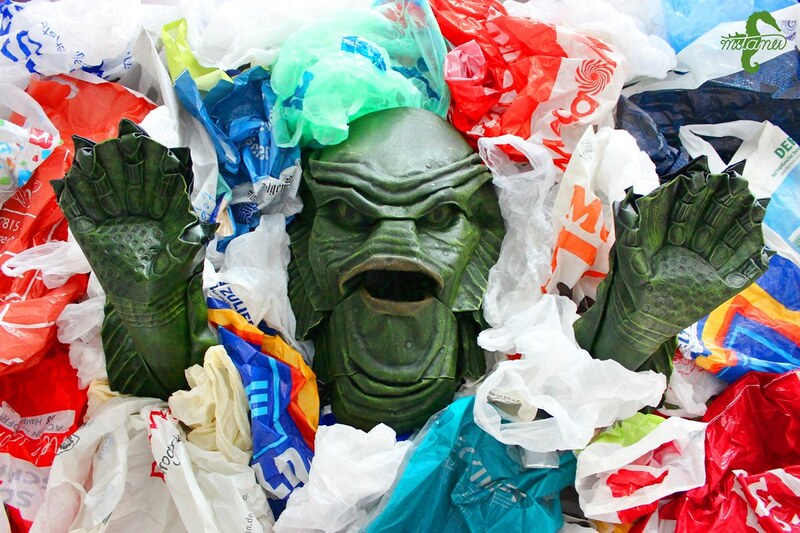 Here is a little twist on a classic monster. Designed and folded by me without the use of scissors or glue. 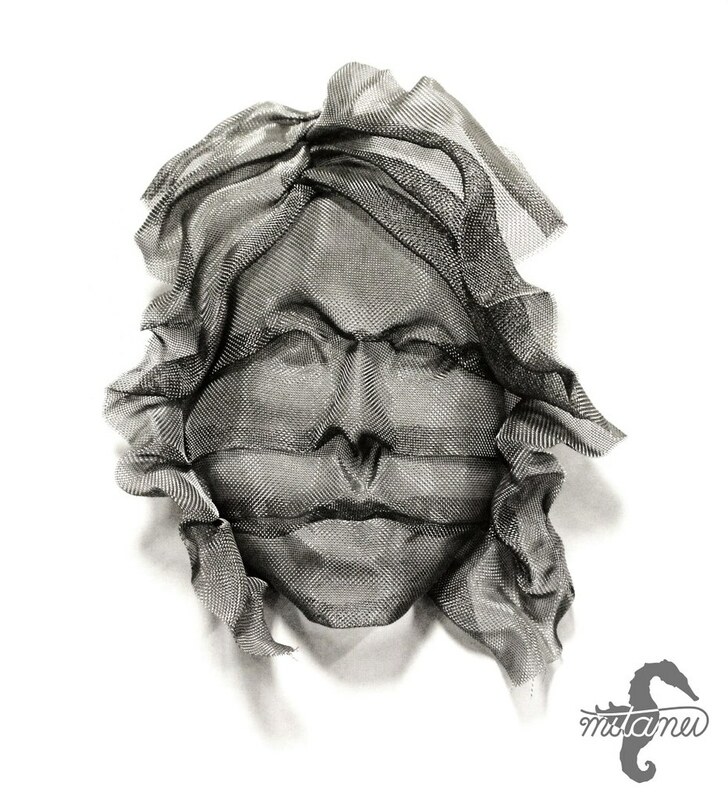 The face and the hands are each folded from a sheet of watercolor paper. 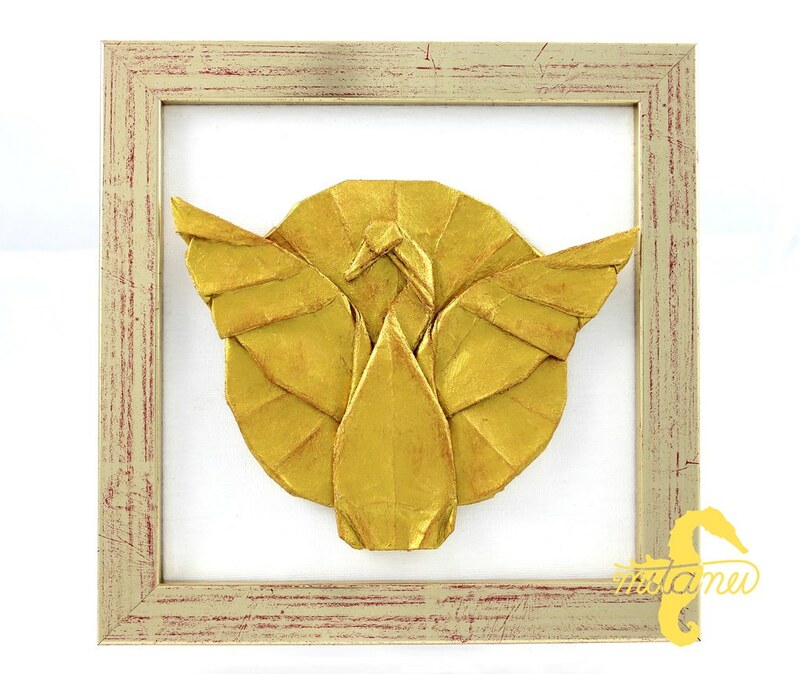 Folded with a rectangle of 300g/m² watercolor paper and painted with 24 carat gold leaf and 23,75 carat shell gold. Folded and designed by me without the use of scissors, glue or tearing. 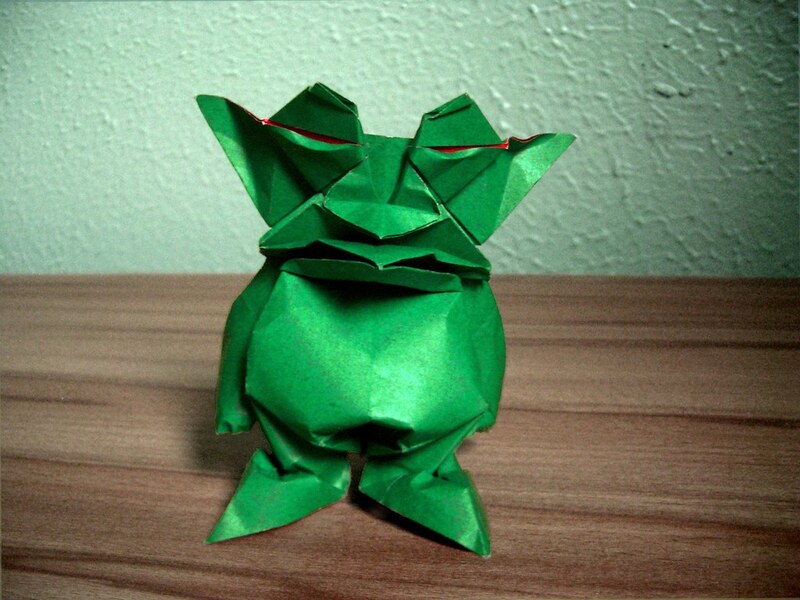 Folded and designed by me. 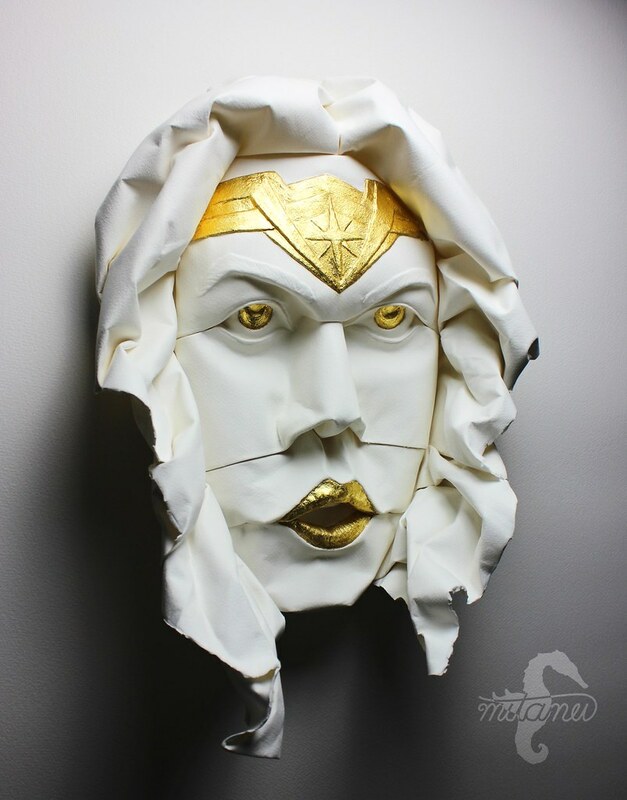 Without using sciossors or glue. Folded from a 65 x 102 cm piece of 356 g/m² watercolor paper. 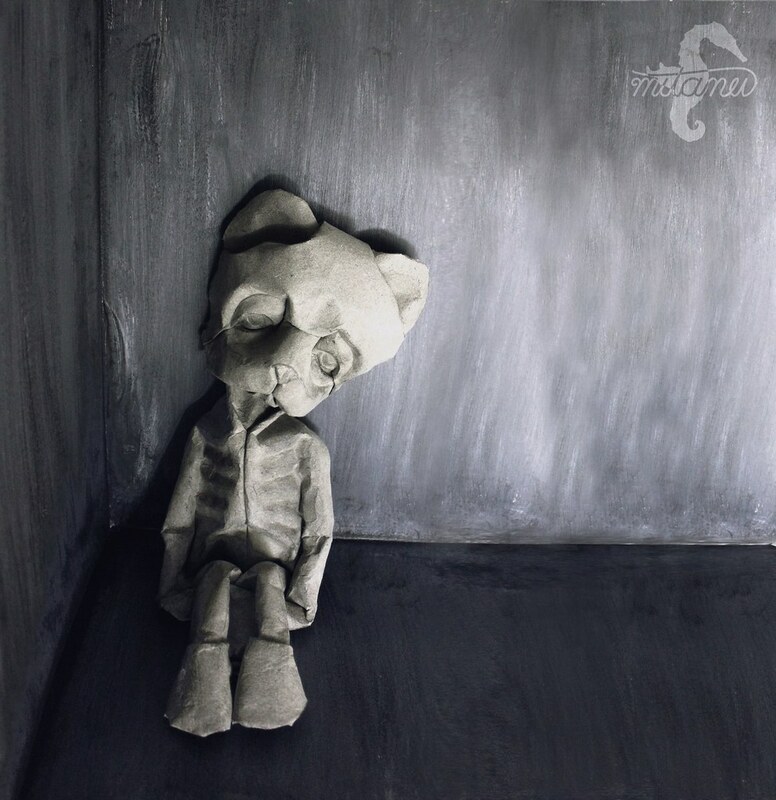 Handmade paper on black canvas (60x80 cm). 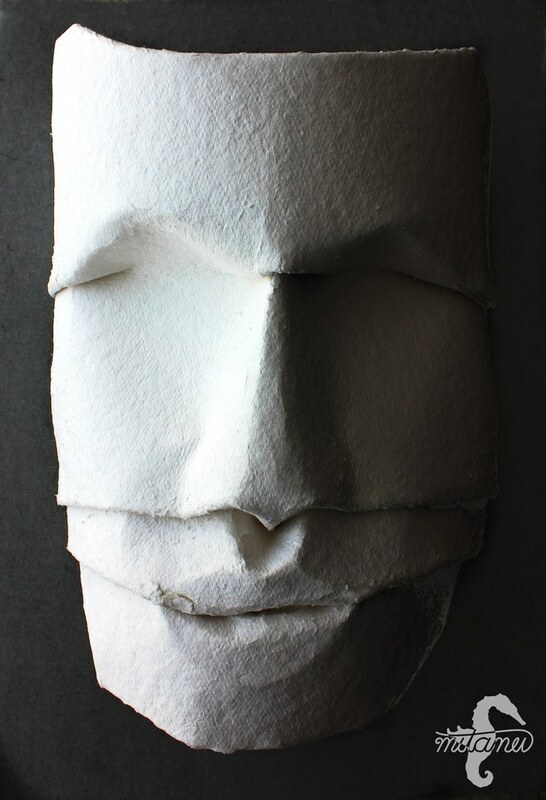 The paper was more like straw fibers pressed loosely together than any other handmade paper I worked with before. Folded from a rectangle of 300g/m² watercolor paper. who said you can't use scissors?! ...also I need new scissors now! Sometimes you need to focus on the details before you can create the whole piece. Folded from one piece of watercolor paper. 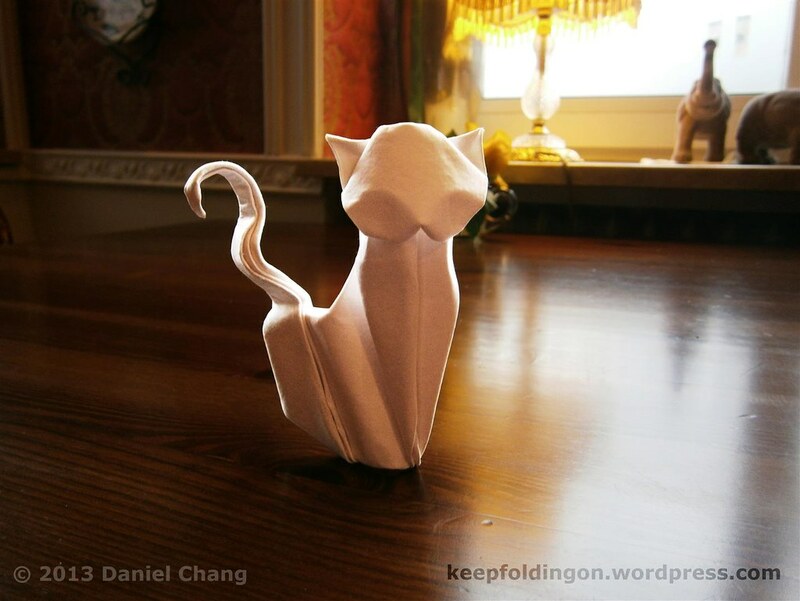 Designed and folded by me without the use of glue or scissors. Folded from a rectangle piece of watercolor paper. Designed and folded by me without cuts or glue. A new Beginning... 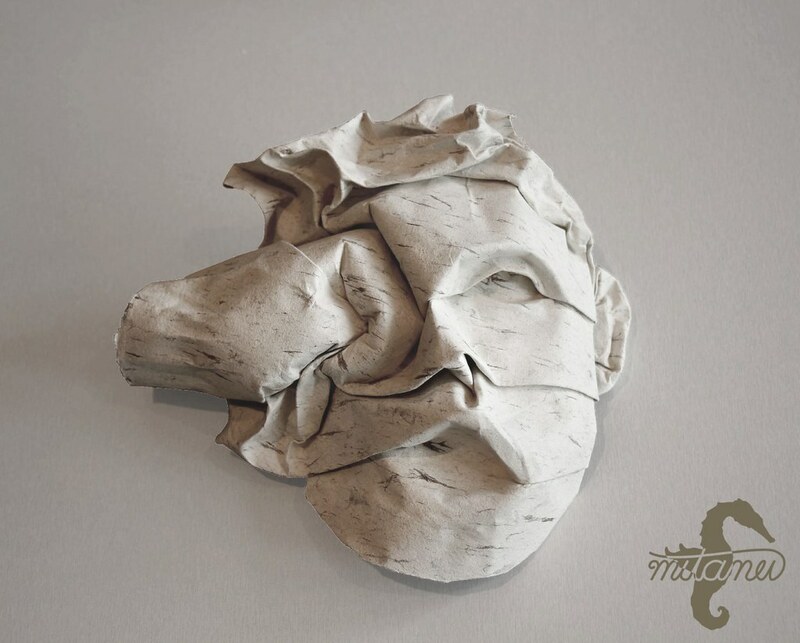 This is a test fold I made during a train ride. Trying to create an infants face Folded from a rectangle of watercolor paper. Designed and folded by me without the use of scissors or glue. 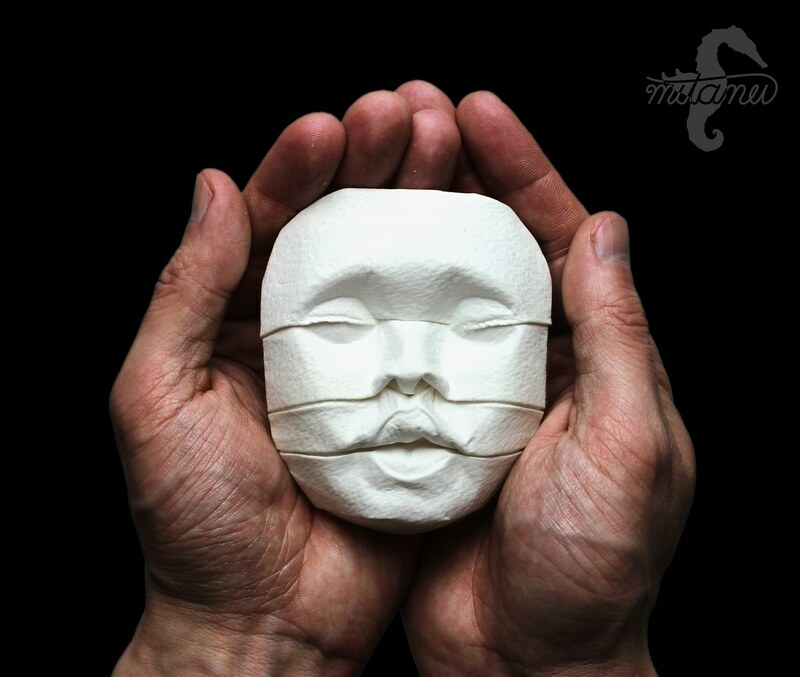 Folded from a coffee mug (from a major coffee company) no cuts, no glue. Folded and designed by me. 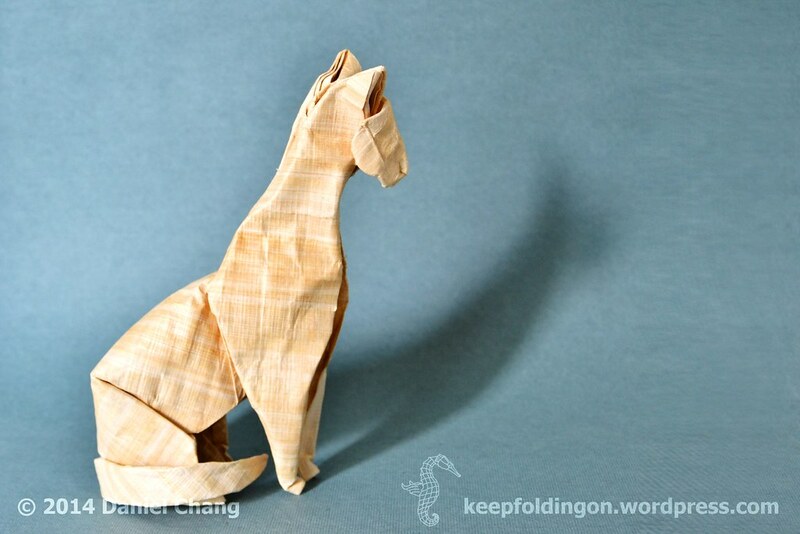 Folded from a rectangle sheet of handmade cotton paper. (Here you can see the original size of the paper: Original sheet) Designed and folded by me without cuts or glue. 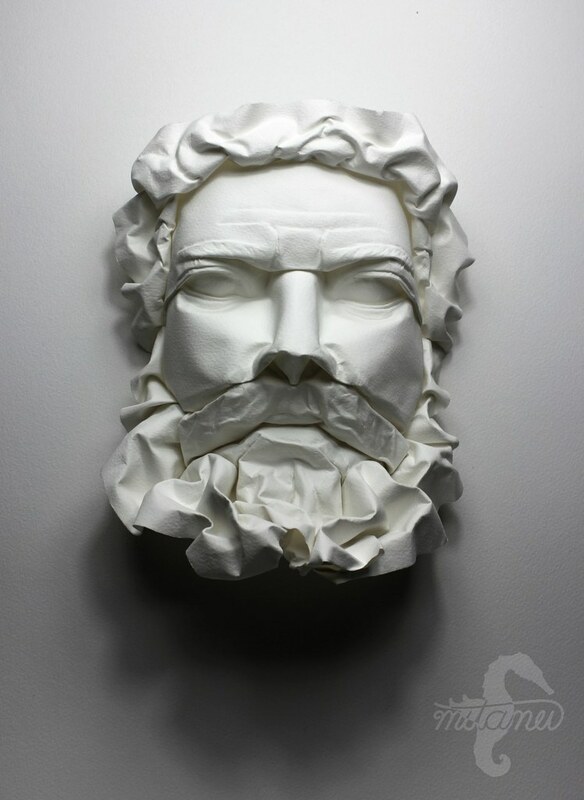 The paper was made by John Gerard. Three Gentlemen I took with me to the BOS50 convention. 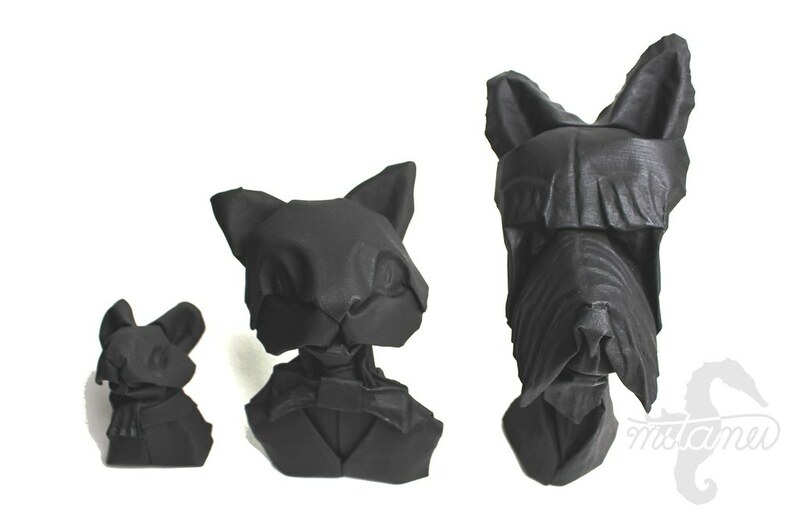 Each bust is folded from a rectangle piece of watercolor paper an colored with acrylic colors. Designed and folded by me. Here are three gentlemen I brought with me to the BOS 50 anniversary. The finished look will be coming soon! Designed and folded by me. No Glue, no cuts. Folded froma rectangle of watercolor paper. Designed and folded by me. No glue, no cuts. Folded from a rectangle of Arches watercolor paper each. Designed and folded by me. No glue, no cuts. After killing his Wife and child, Hercules had to accomplish twelve labours. 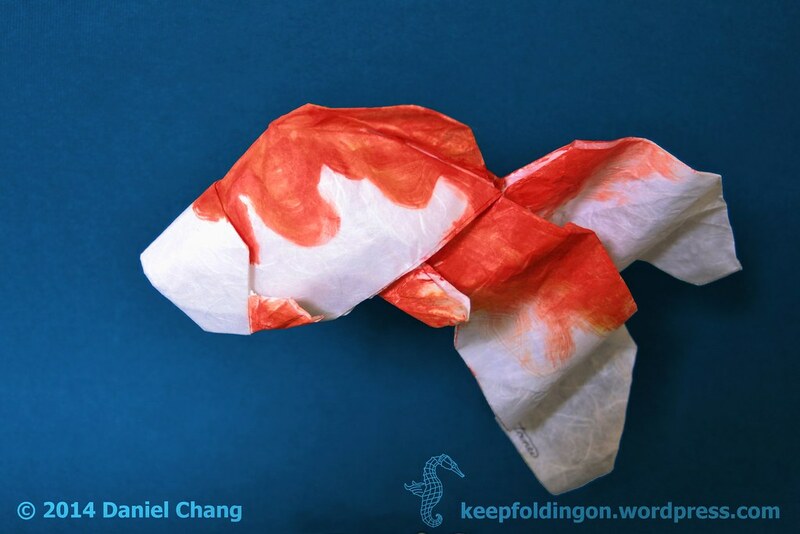 Folded from a single rectangle of Arches water-color paper. No glue, no cuts. Folded and designed by me. Inspired by the Herkules statue in Kassel (Germany). 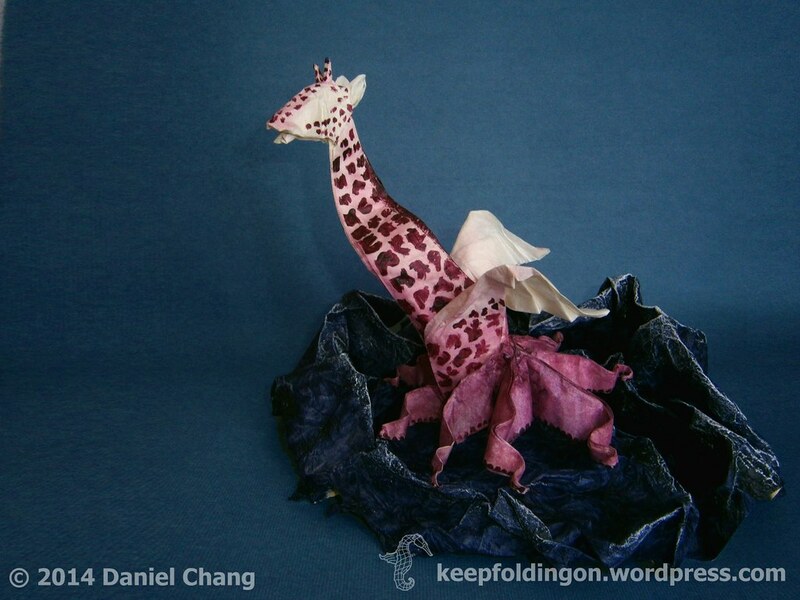 Here is a little test fold I made during the 29th German Origami Convention in Bonn. Folded from a rectangle of Arches water color paper. Designed and folded by me. Here is another testfold. This time it's about human facial muscles. Folded and designed by me. Inspired by nature. The last bunny of my Easter doodle. I wonder what he is up to? Wet-folded from a rectangle of Arches watercolor paper. Folded and designed by me. 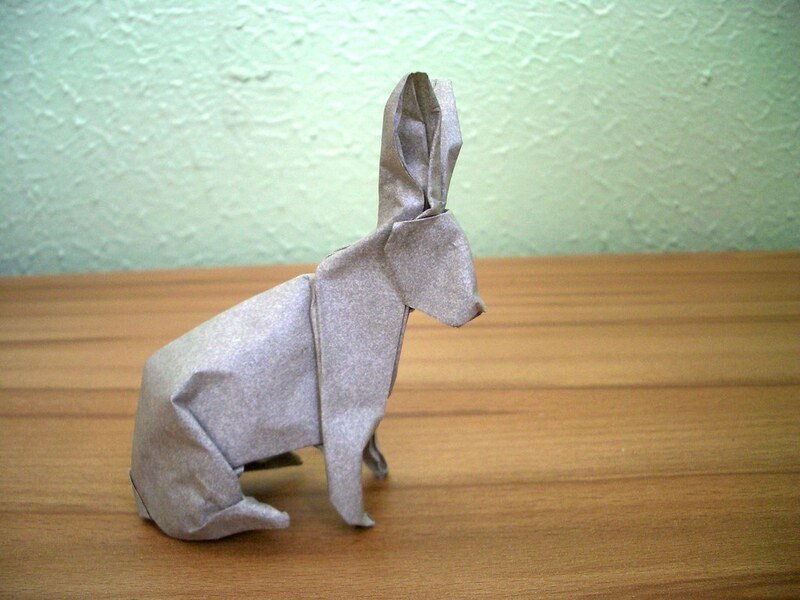 Here is another doodle fold for Easter. Wet-folded from a rectangle of Arches watercolor paper. Folded and designed by me. Have you seen my eggs? 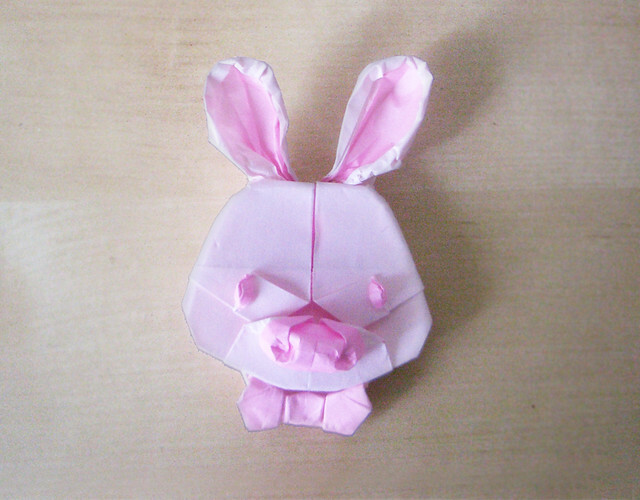 A little doodle fold for easter. Wet-folded from a rectangle of Arches watercolor paper. Folded and designed by me. 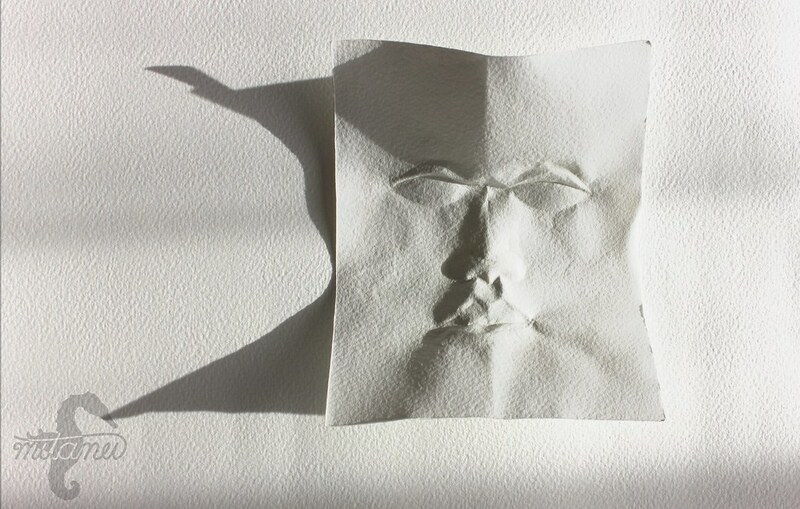 A female face folded from a rectangle of Arches watercolor paper. The features of the face are a bit raw since this was more a tryout for an idea on how to fluently dissolve the creases from the face towards the hair. Designed and folded by me. Folded from a rectangle of watercolor paper Designed and folded by me. A little test fold with a fine metal mesh. Folded and designed by me. wet-folded from a rectangle of water color paper. Folded and designed by me. The new year is already progressing but I wish you all none the less a good (mythical) year 2017. 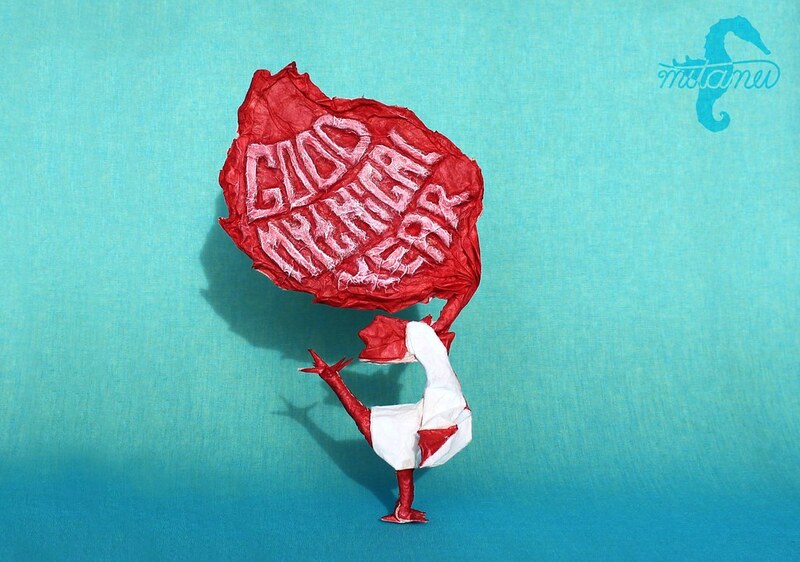 Since it is the year of the rooster I choose the logo of "Good Mythical Morning" as inspiration. It is a youtube show by the talented entertainers Rhett&Link I also choose it because of my history with mysthical rooster-like creatures that use fire. 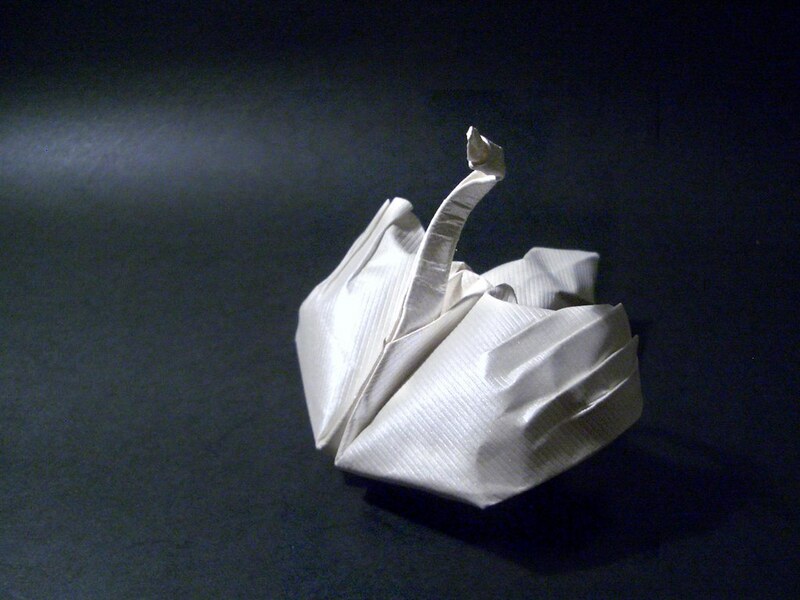 This Origami model was designed and folded by me from a single sheet of 93 cm x 15 cm double color tissue paper. The logo this is based on is Copyright © of Rhett & Link. 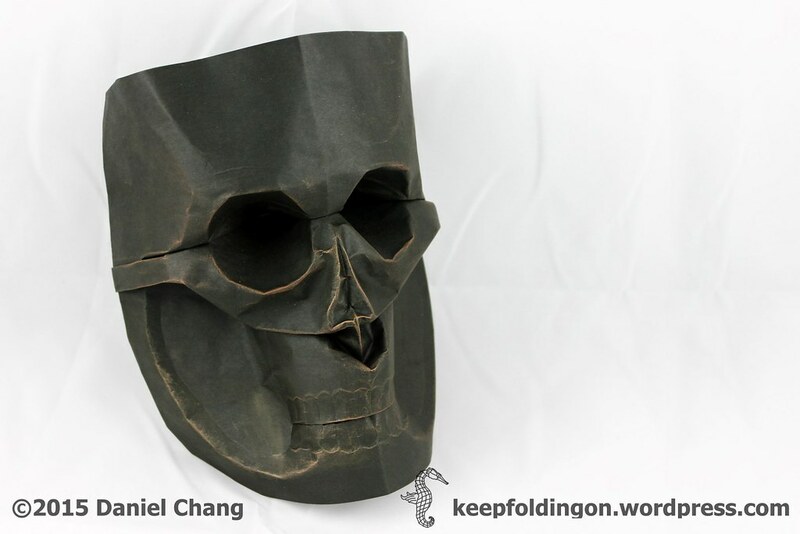 Folded from a Strainer (because why not). Designed and folded by me. 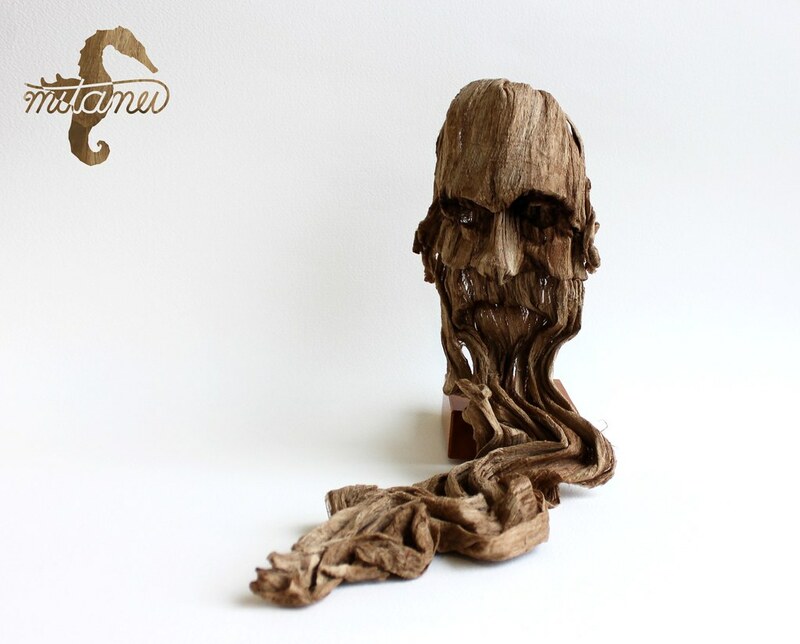 Is was quite interesting to fold with a tree bark as it is harder to shape and not as sturdy as watercolor paper. Wet-folded from a piece of bark. Designed and folded by me. Folded from a rectangle of watercolor paper. Designed and folded by me. This was a quick face study I did during a train ride. Wet-Folded from a rectangle of watercolor paper. Folded and designed by me. Wet-Folded from a rectangle piece of Arches watercolor paper. Designed and folded by me. 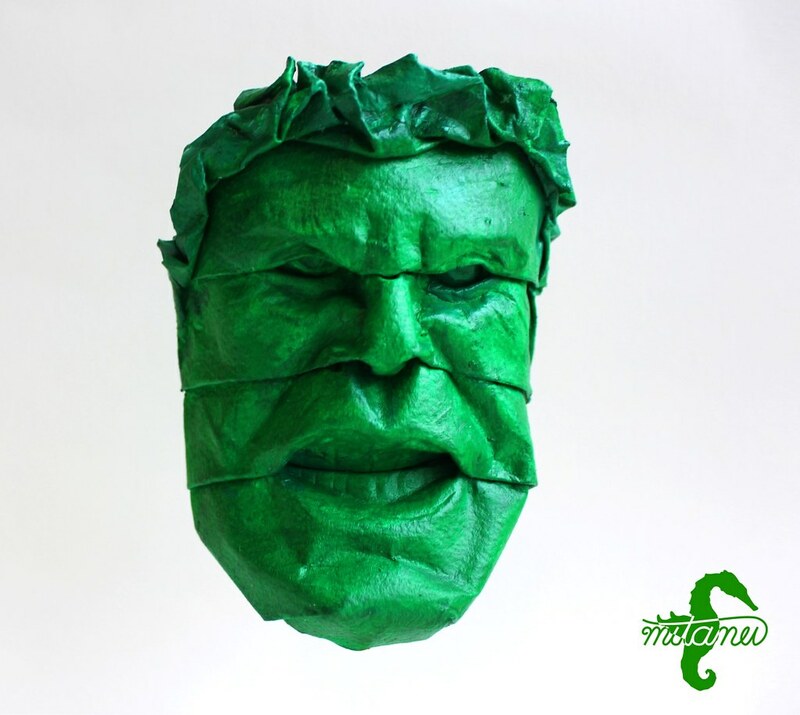 Inspired by an angry green giant. Wet-Folded from a rectangle piece of Arches watercolor paper. 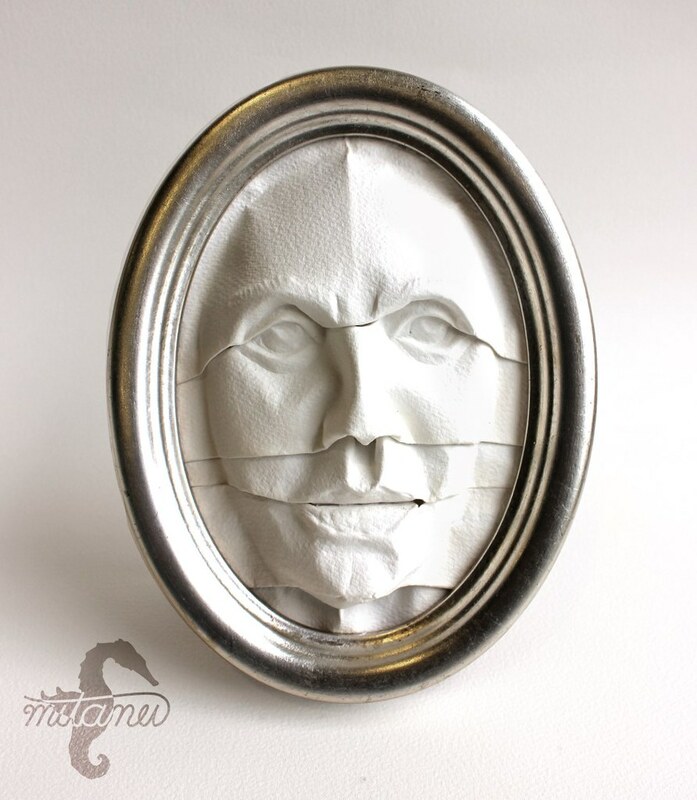 This face was inspired by the incredible "character heads" of Franz Xaver Messerschmidt. 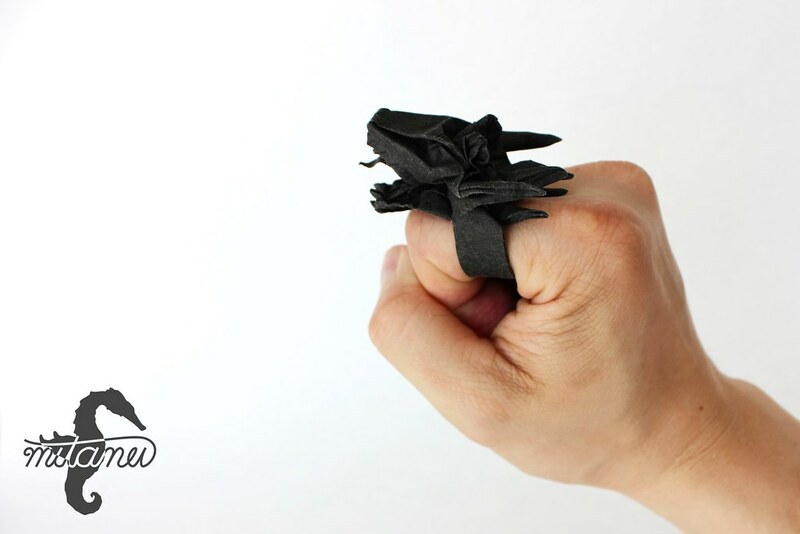 Just before I went home from this years German Origami Convention I was doodling around with a dragon ring that I gave a away, but because it wasn't well done I decided to see if I could make a better version. Folded from a square of 20 x 20 cm paper from the papermakers John and Jeannette. 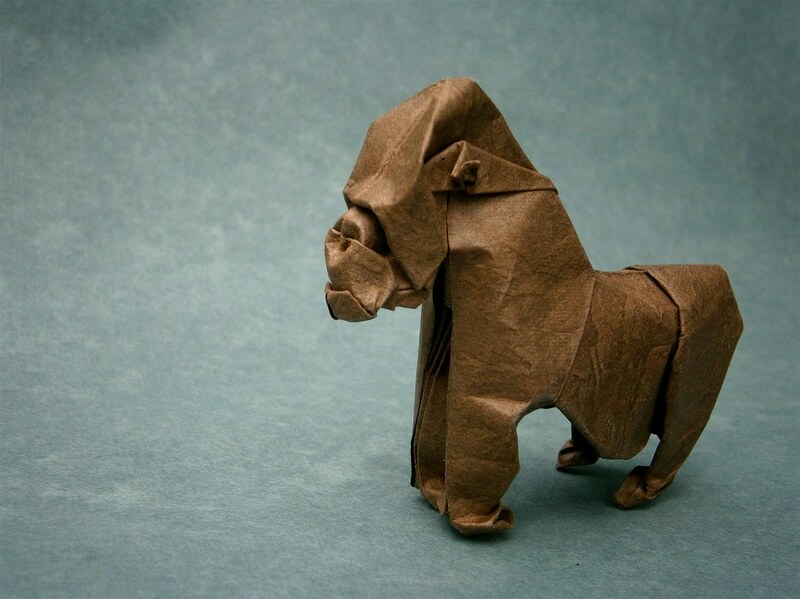 Folded and designed by me. Sometimes when you think what you want to do isn't possible you just have to try it anyway. Wet-folded from a rectangle of 56 x 76 cm Moulin-Bütten-watercolor cardboard (1.200 g/m²)! Designed and folded by me. 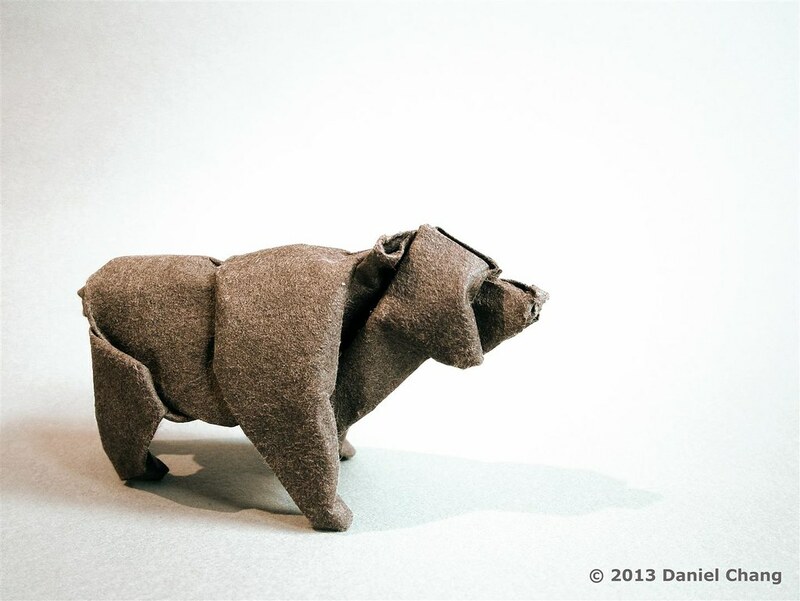 Folded from a square of 25x25 cm of fur tissue-foil paper. What is the new without the old? Toy Robot folded from a square of 15x15cm foil paper. Colored with spray paint. 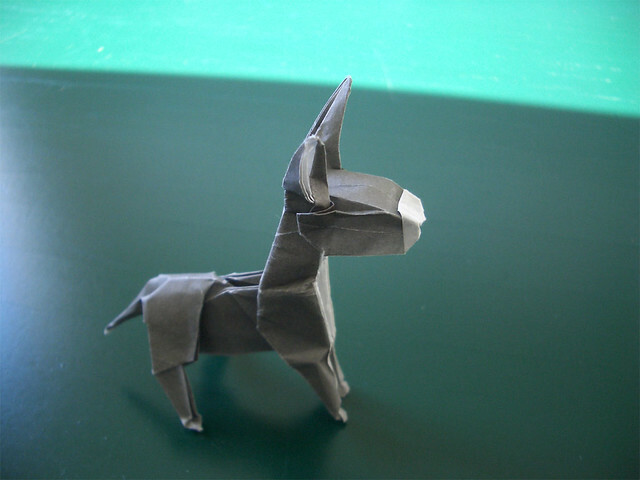 Unicorn folded from a square of 45x45cm Elefantenhaut. Colored with acrylic pigment color. Designed and folded by me. Everyone At the German Origami Convention 2016 in Erkner got some sample sheets from the paper makers John and Jeannette. Since the envelop was also handmade paper I wanted to use it aswell. Here is the result as suggested by my friends. Thank you to Peter Stein for taking the picture!. Once a while I get asked If i can fold something out of money. 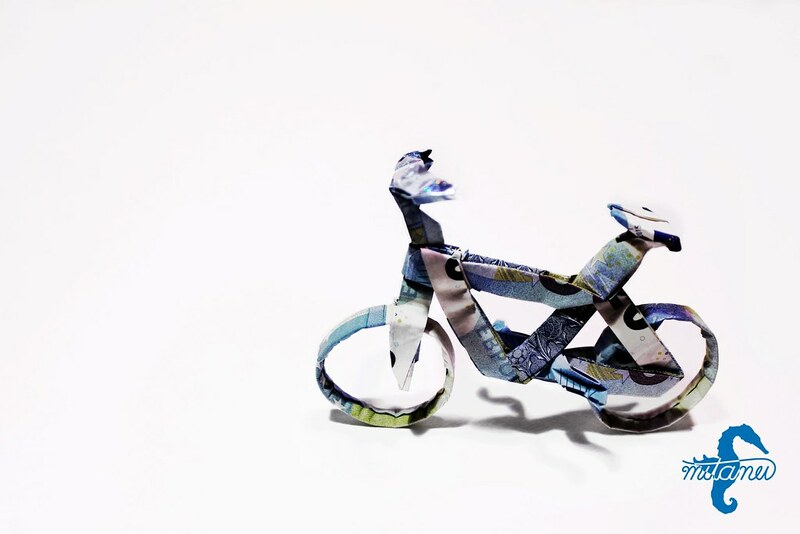 This time it was a request for a bicycle. Partly wet-folded from seven 20 Euro bills. (The new ones are a pain to fold) Folded and designed by me. No cuts no glue. Just two wanderer passing by. 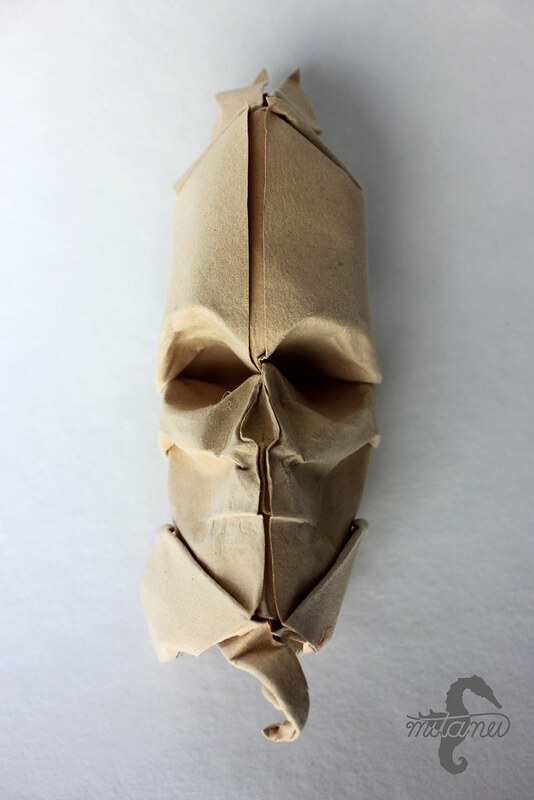 Folded from a rectangle of 62 x 30 cm and a rectangle of 10x 15 cm piece of linen bookcloth sandwich paper. Designed and folded by me. This is a test fold form a left over piece of 180g/m² Arches watercolor paper. It is a study for another piece of my "Human Nature" series. Designed and folded by me. 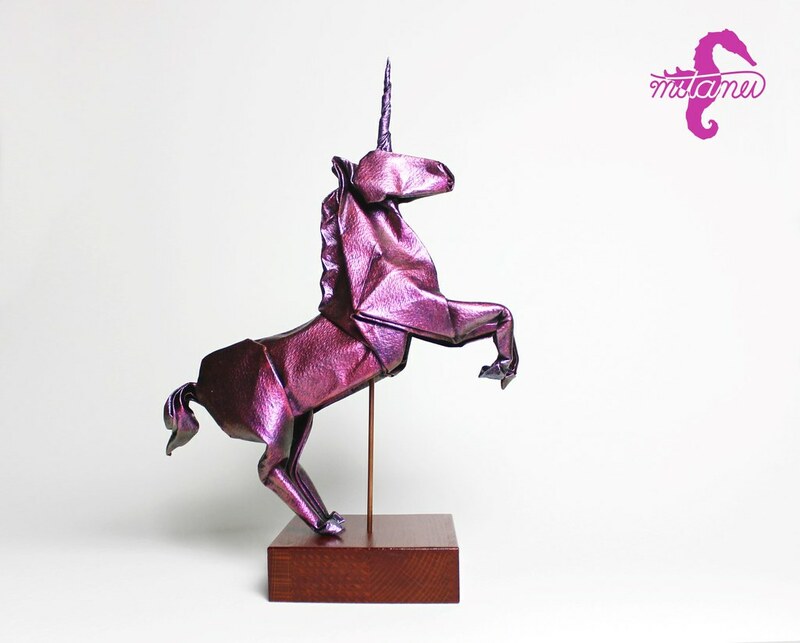 Following my own teachings I wanted to explore new ways of Origami and paper art to create more artistic sculptures. 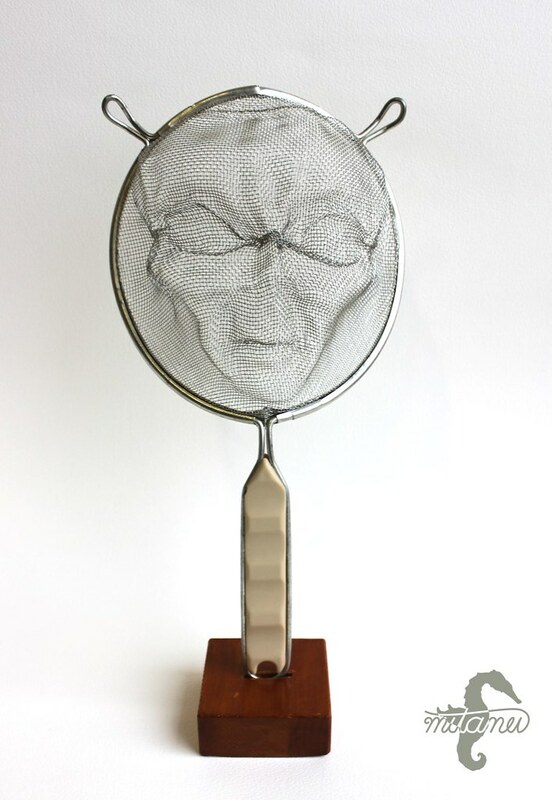 This is another piece in my series "Human Nature". Wet-Folded from a rectangle of roughly 102 x 66 cm Arches water color paper (300g/m²), Designed and folded by me. Folded from one piece of roughly 65 x 38 cm double colored washi deluxe. 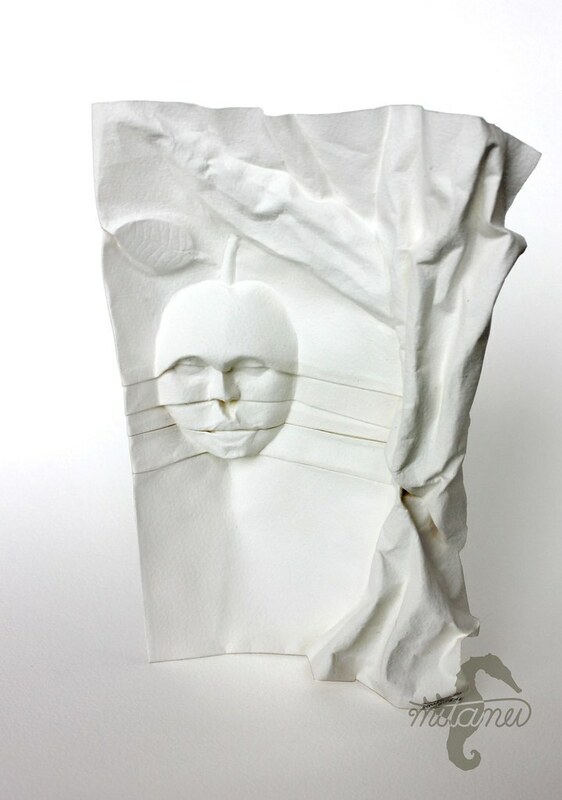 This is the first piece in a series called "Human Nature" Folded and designed by me. Inspired by life. 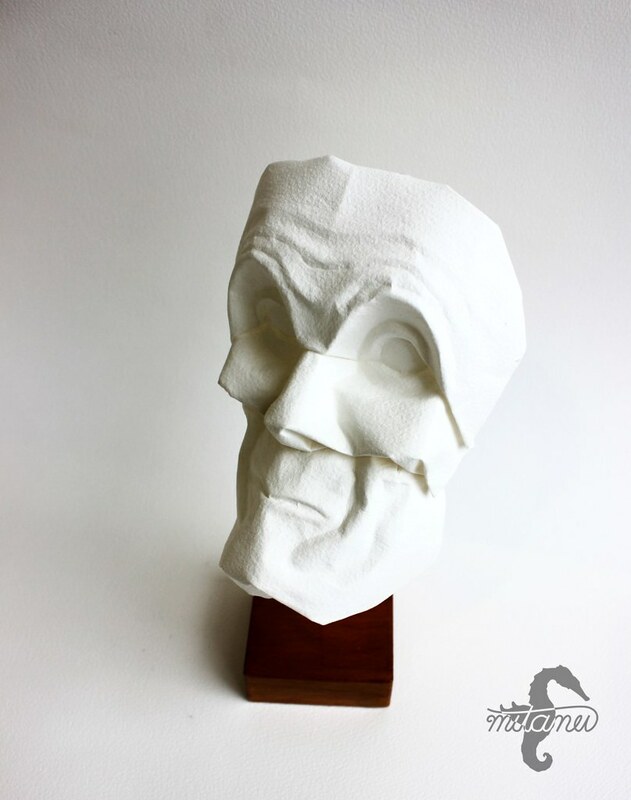 Relatively speaking this is one of my older designs but it is part of a longer facial study series I'm still working on. I used this little monster as reference for the head. 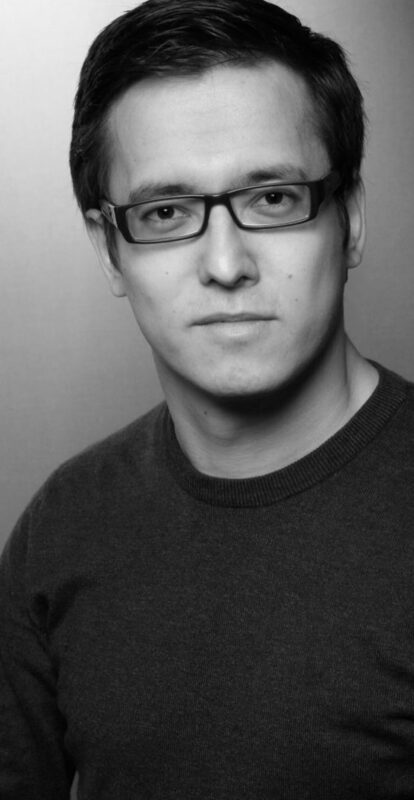 (The photograph was taken by the talented Lucy Hermsen.) Wet-Folded from a square of 20 x 20 handmade paper by the outstanding paper makers John and Jeannette. Designed and folded by me. No glue no cuts. Wet-Folded from a square of 60 x 60 cm Arches acrylic paper (185g/m²). Designed and folded by me, inspired by Giang Dinh, József Zsebe and Hoàng Tiến Quyết. This is a little experiment I came up with after visiting the salt mine "Wieliczka" near to Krakow last year. I put the fox in a salt water bath and let it slowly evaporate over the course of a week. 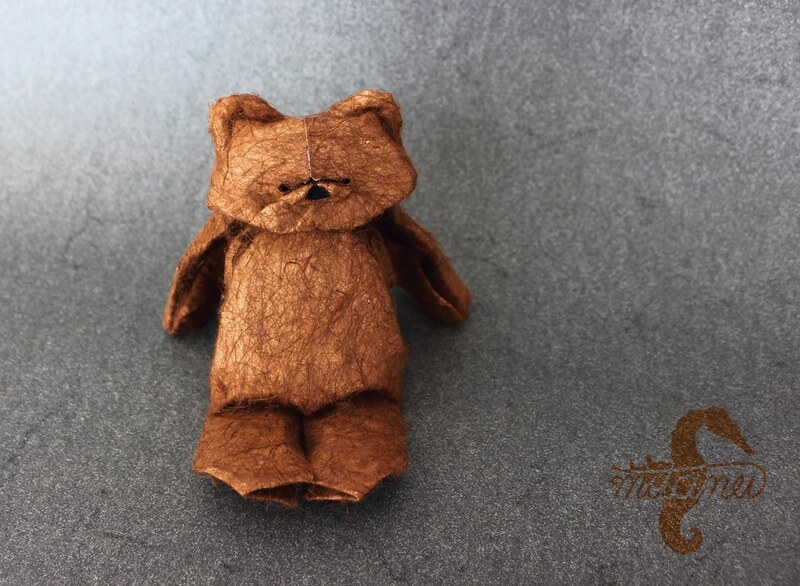 This little guy is a test fold for something else. Wet-folded from a square of roughly 5 x 5 cm Arches watercolor paper. I wanted to try to combine two of my models to something special. Wet-Folded from a square of 35 x 35 handmade paper by the outstanding paper makers John and Jeannette. Designed and folded by me. No glue no cuts. Here is the side view. I wanted to try to combine two of my models to something special. Wet-Folded from a square of 35 x 35 handmade paper by the outstanding paper makers John and Jeannette. Designed and folded by me. No glue no cuts. Here is the top view. 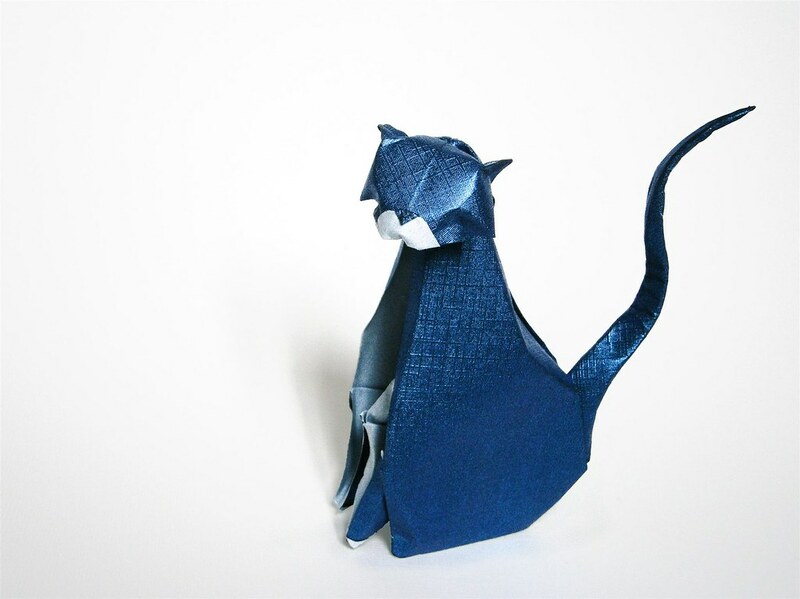 A sitting cat folded from a square of 60 x 60 cm Arches acrylic paper (185g/m²). 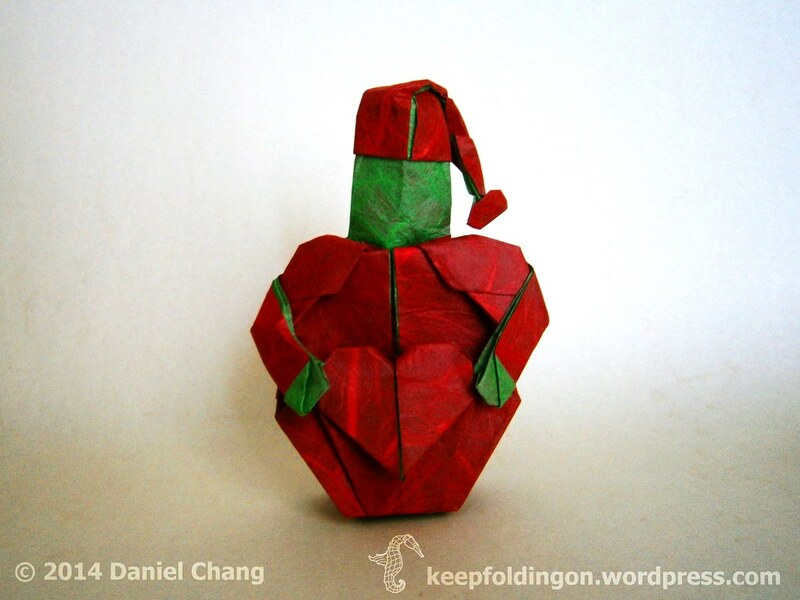 Designed and folded by me, inspired by Giang Dinh, József Zsebe and Hoàng Tiến Quyết. Folded from a piece of 20 x 20 cm acrylic paper. Design by me. One of my older models. 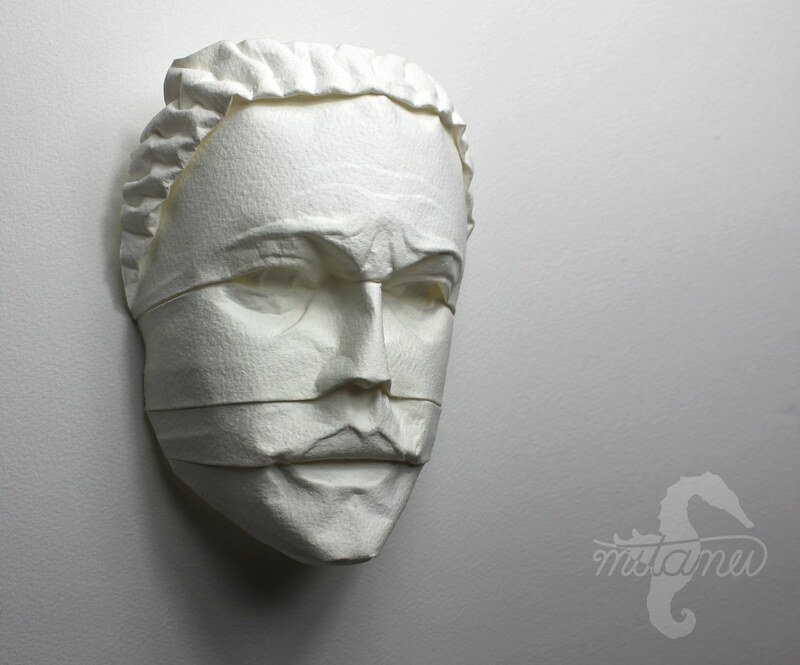 Folded from a square of roughly 35 x 35 cm washi paper, MC-treated. This winged lion is based upon my winged elephant. 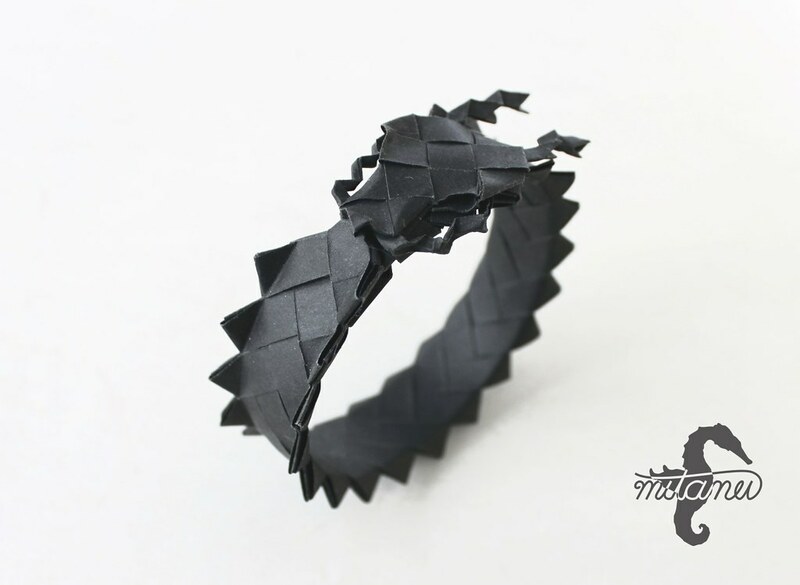 Modular Origami Bracelet folded from multiple strips of Elefantenhaut paper. This Bracelet is based upon the amazing Zag-zig Bracelets from Dasa Severova. Wet-folded from 6 squares of hand-made water color paper. Design by me. 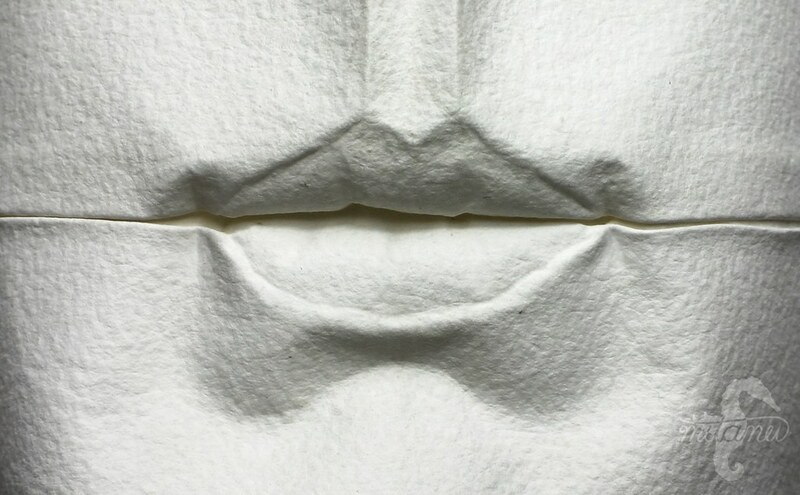 Wet-folded from a square of approx. 45 x 45 cm square of 300gsm Archés watercolor paper. 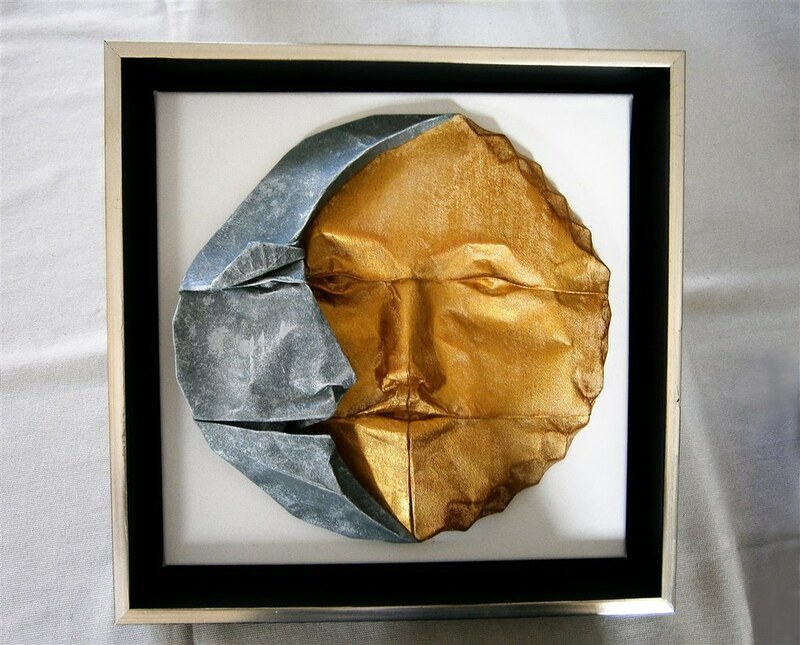 Designed and folded by me, inspired by Giang Dinh, József Zsebe and Hoàng Tiến Quyết. This started out as a testfold for another model I will upload shortly. Wet-folded from a 30 x 30 cm square of Elefantenhaut. Folded and designed by me. Move along I'm just a fish. I found out that designing flowers and fish (among other things) is not my strong point. 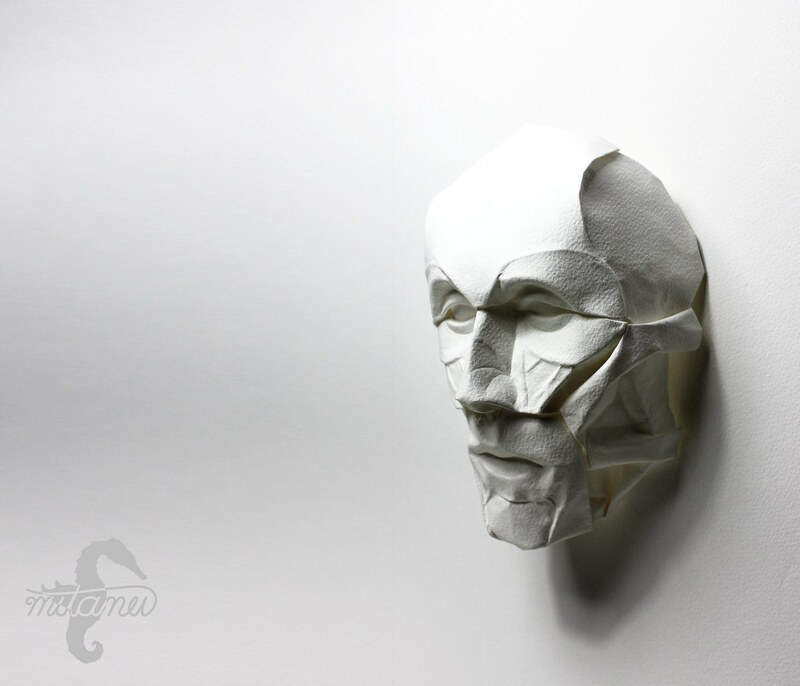 Folded from a 40 x 40 cm square of paper. Design by me. I hope the title doesn't sound to inflated. 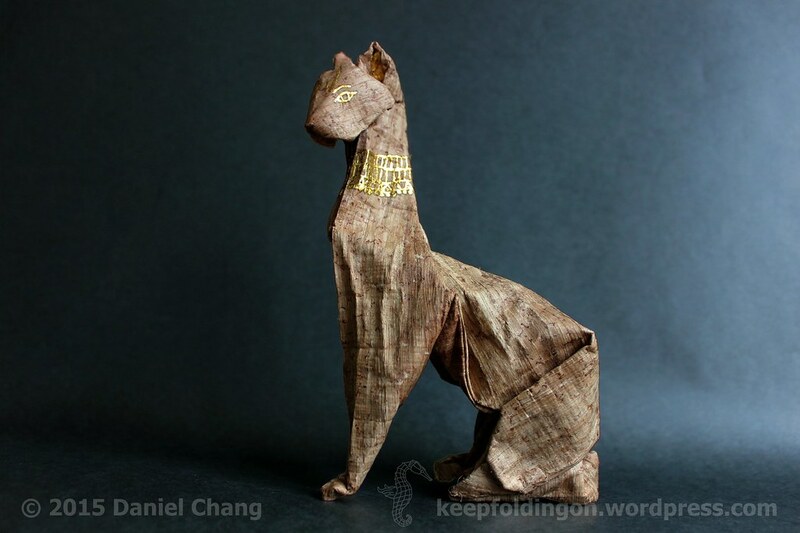 Since I do like cats I wanted to create the Egyptian godess Bastet. It was also a good opportunity to try papyrus as a folding material which surprisingly well-suited for wet-folding. 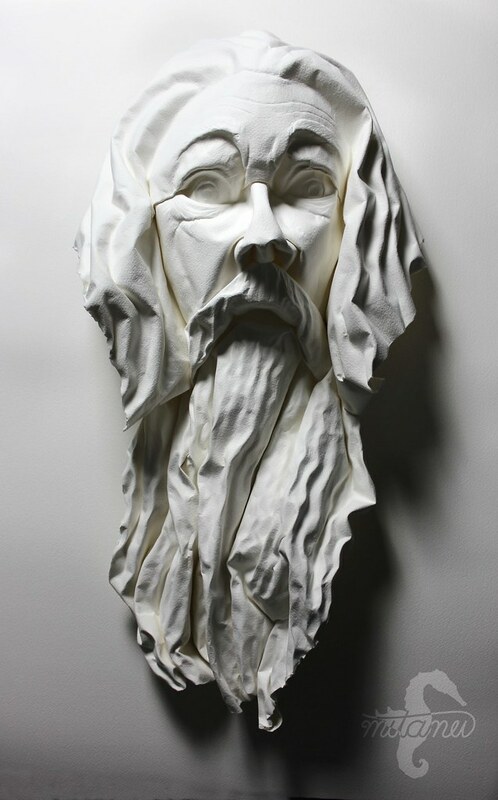 Wet-folded from one 60 x 60 cm square of traditional made papyrus. Design by me. Inspired by culture and history. I do not allow the commercial use of my artwork without my approval! Binomial name: Giraffa davyjonsii aeolus Friends of mine gave me the idea to create this winged herbivore. 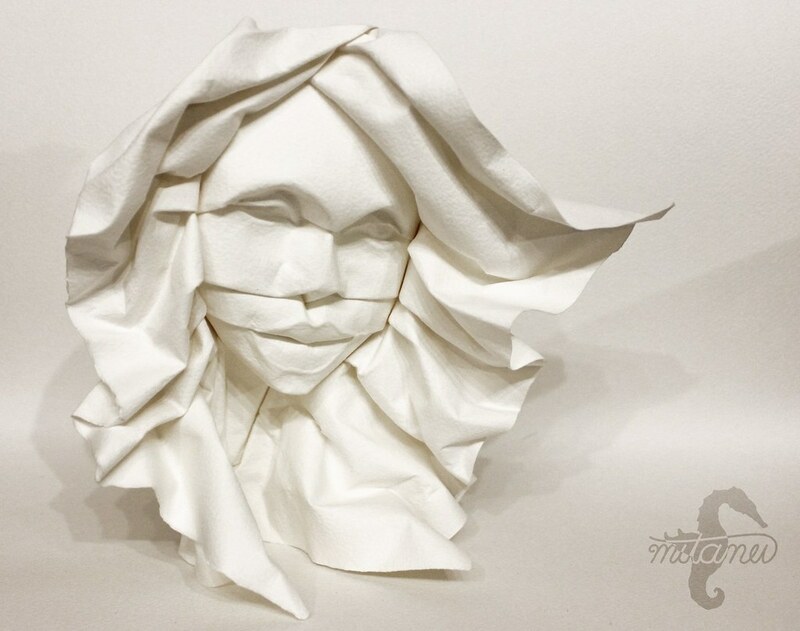 Wet-folded from one 60 x 60 cm square of Taizan paper. Colorized with acrylic paint. 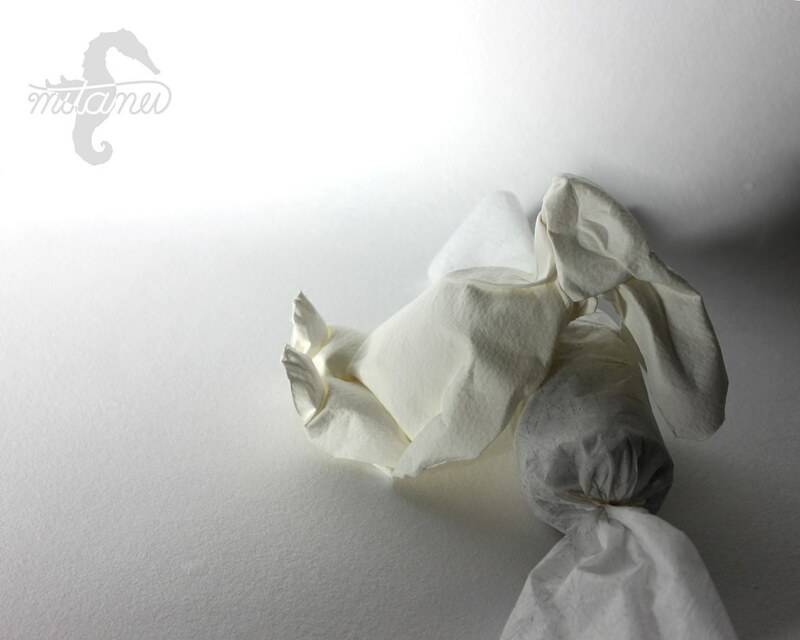 (Waves folded from cotton paper.) Design by me. I do not allow the commercial use of my artwork without my approval! In Germany there is a word that can be used as a synonym for heart attack which is "Herzkasper". 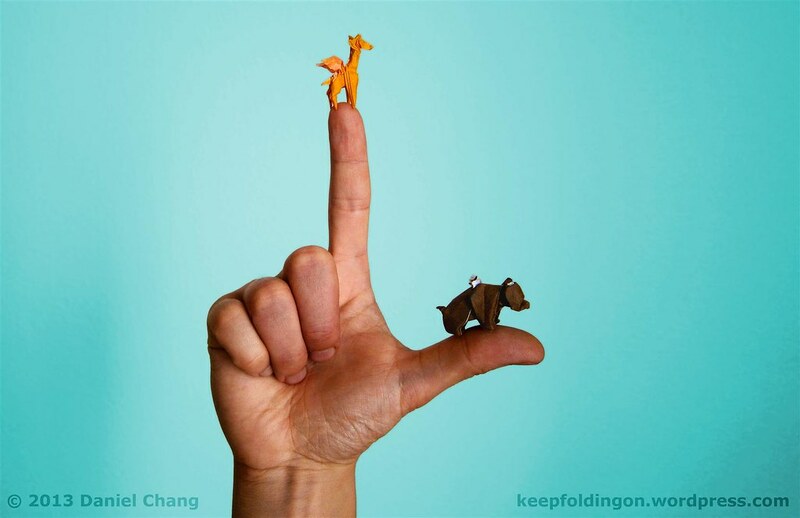 A "Kasper" also is a little hand puppet that is often used in a puppet theater for kids here in Germany. 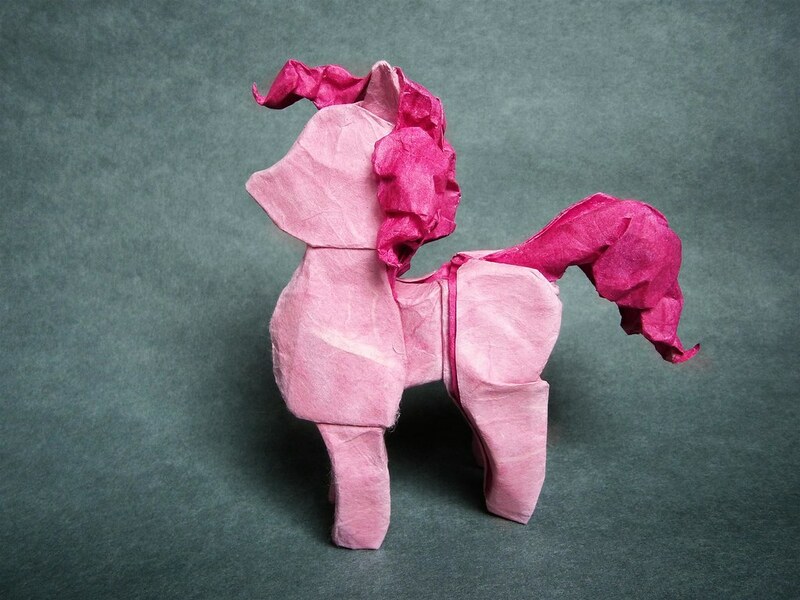 Folded from a 25 x 25 cm square of double colored tissue paper. Design by me. I do not allow the commercial use of my artwork without my approval! 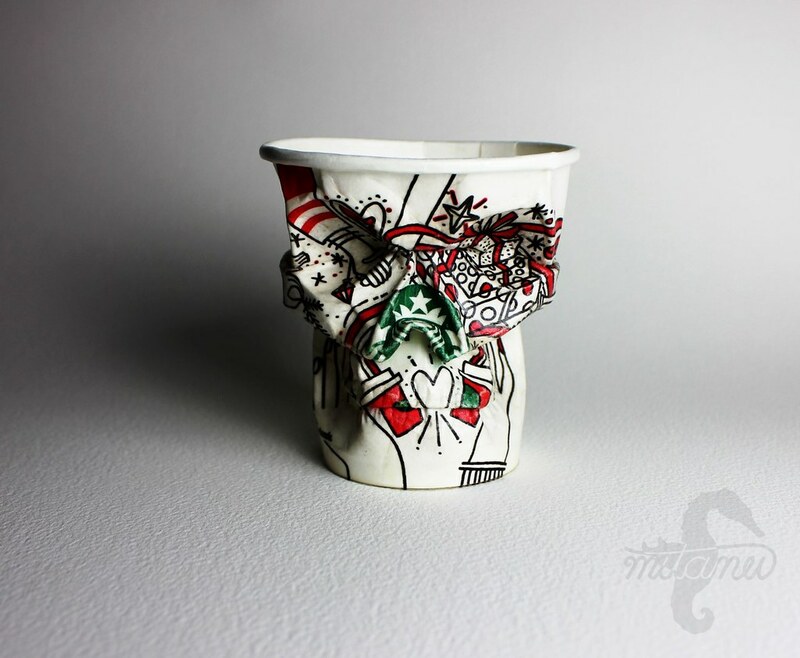 For this little project I combined two things that are dear to me: winged creatures and coffee! 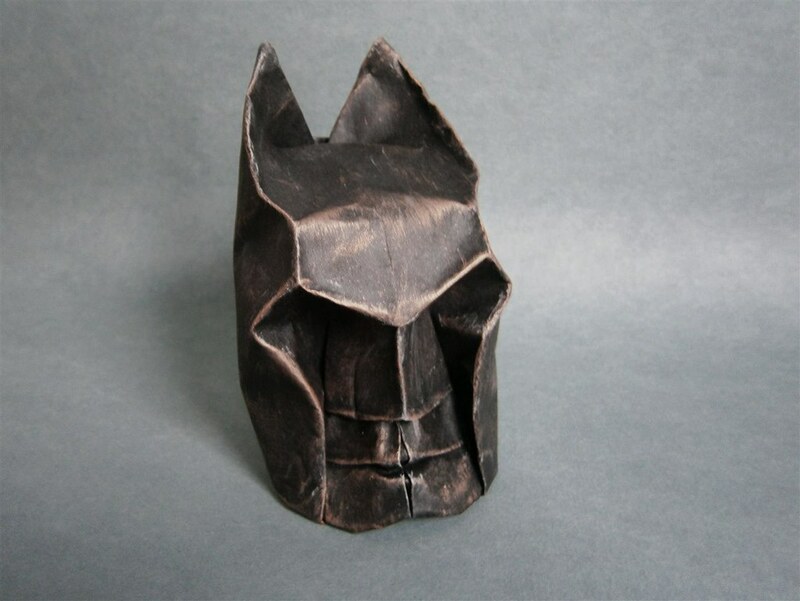 Wet-folded from one 60 x 60 cm square of Taizan paper. Colorized with coffee (nothing else). Design by me. I do not allow the commercial use of my artwork without my approval! 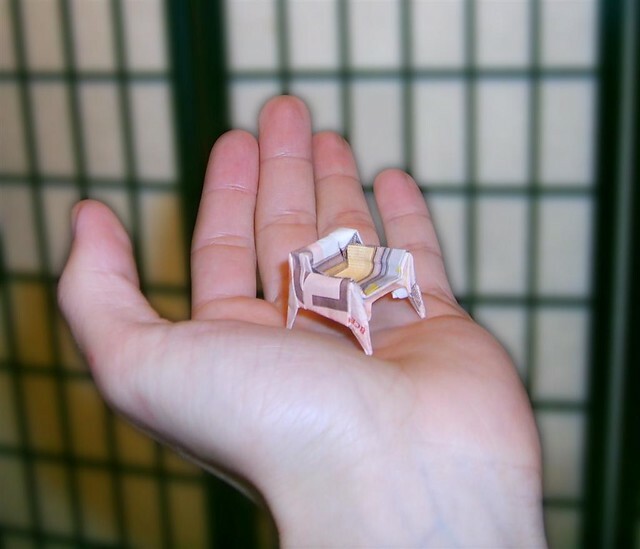 I had the idea for this model already in January but didn't find the time to fold it. 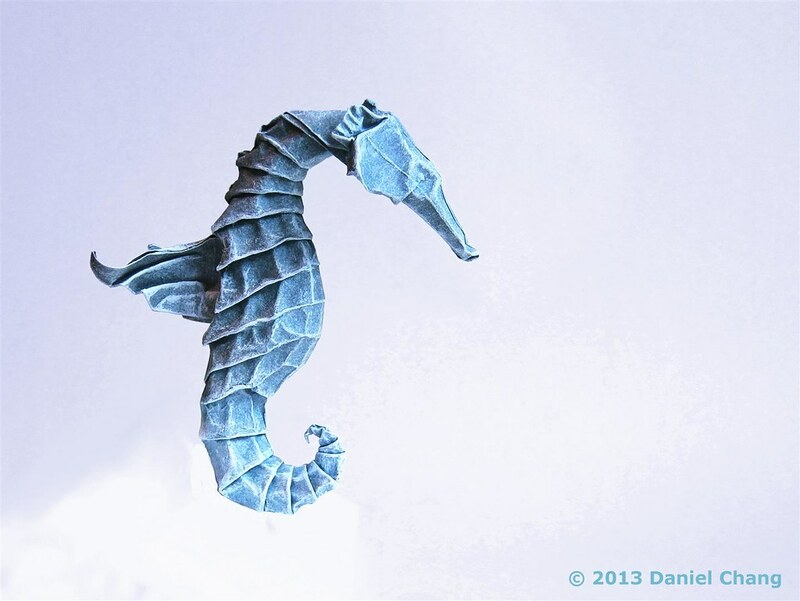 It is my interpretation for the year of the horse 2014. 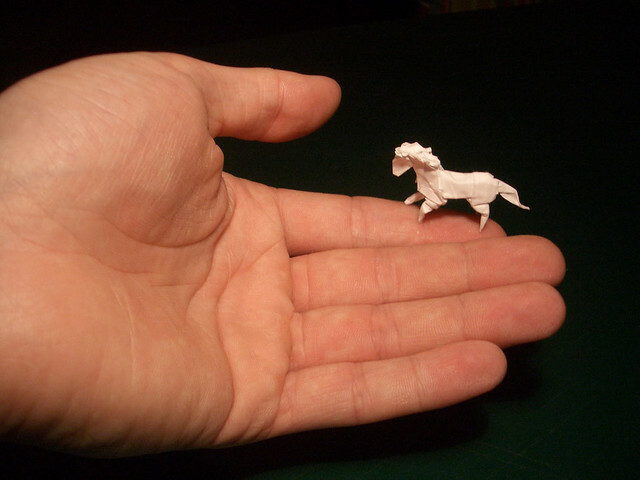 Folded from a 35 x 35 cm square of paper. Design by me. Inspired by nature. I do not allow the commercial use of my artwork without my approval! 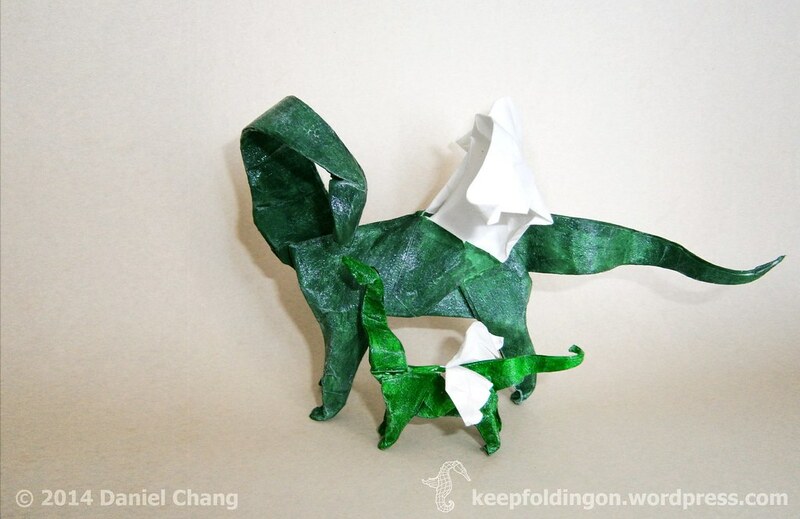 Two winged brontosauruses each folded from a square of paper (25 x 25 and 15 x 15 cm). 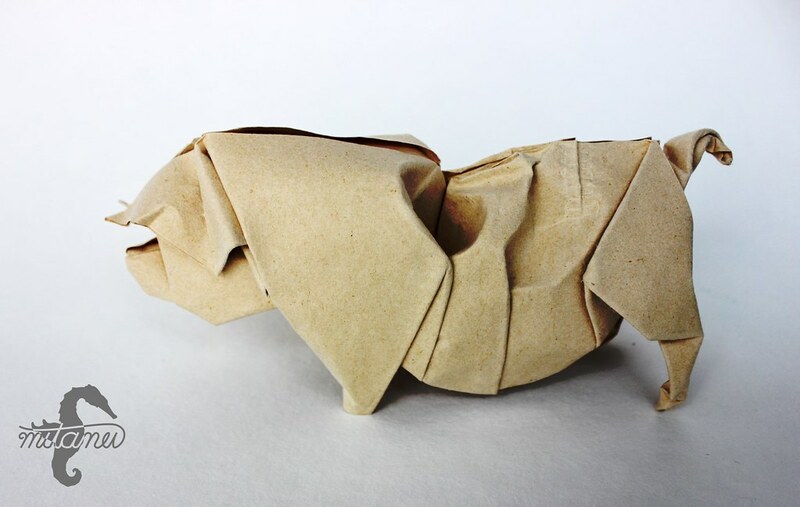 Folded from the bird base. The model were colorized and treated with crackle glaze (though the effect was a bit dissapointing). Design by me. I do not allow the commercial use of my artwork without my approval! Acknowledge your wings and fly! This is my last entry for this year. I wish you all a happy and healthy new year! 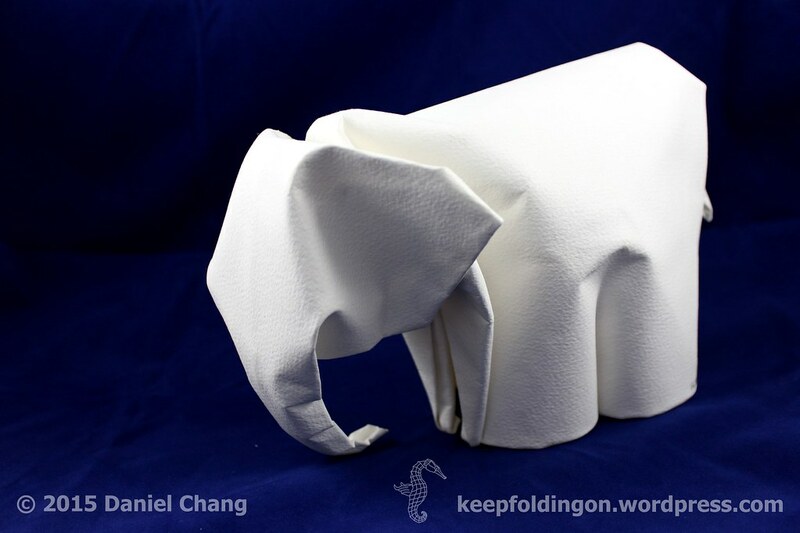 Winged Elephant wet-folded from a 50 x 50 cm square of double-colored "Elefantenhaut"-paper (two papers where glued together with MC to achieve the double-colored effect). Design by me. I do not allow the commercial use of my artwork without my approval! A simple cat I designed. Wet-Folded from a square of heavy water color paper. Design by me. No Glue, no cuts. Never let anyone stop you from pursuing your dreams! 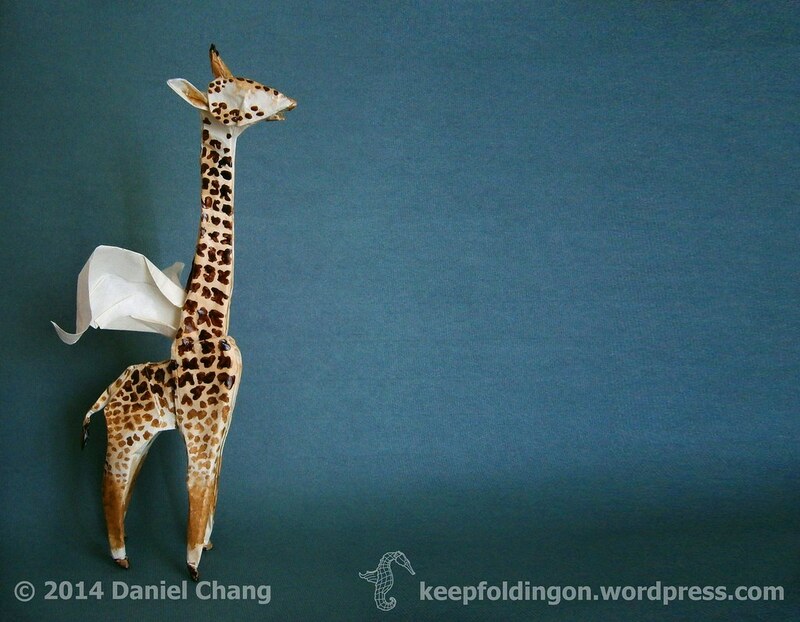 Here are two of my winged Origami creatures: The Winged Giraffe and the Winged Bear Each is folded from a single square of of double-colored 7,5 x 7,5 cm paper. Folded by me, Design by me. No cuts, no glue. 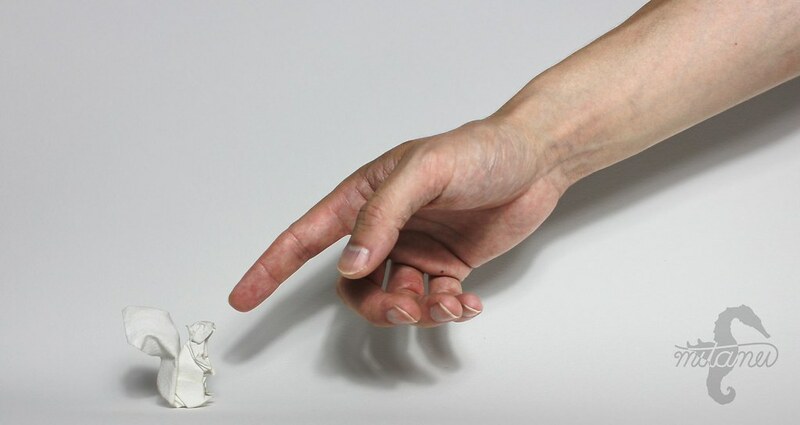 It was a bit of a challenge to take the photo with the models balancing on one hand and the camera in the other. 🙂 Please do not use my artwork for commercial purposes without my approval. 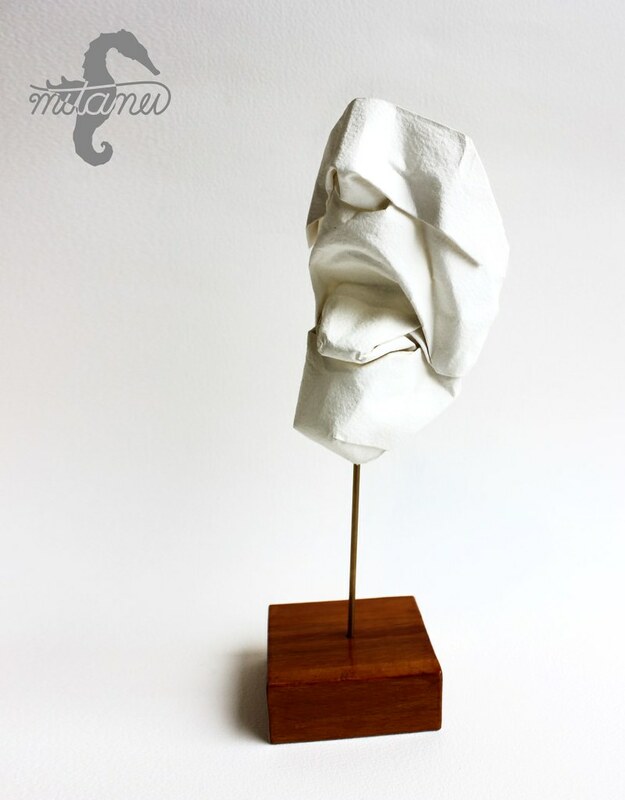 Wet-Folded by a 25 x 25 cm square of Elefantenhaut and lightly brushed with white acrylic color. Folded and designed by me. 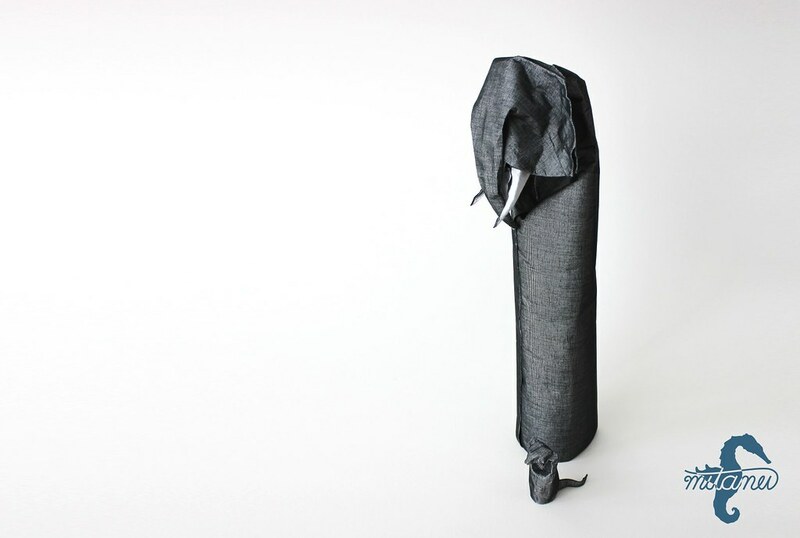 Wet-folded from a square of 20 x 20 cm of 100% recycled blue jeans. Design by me. 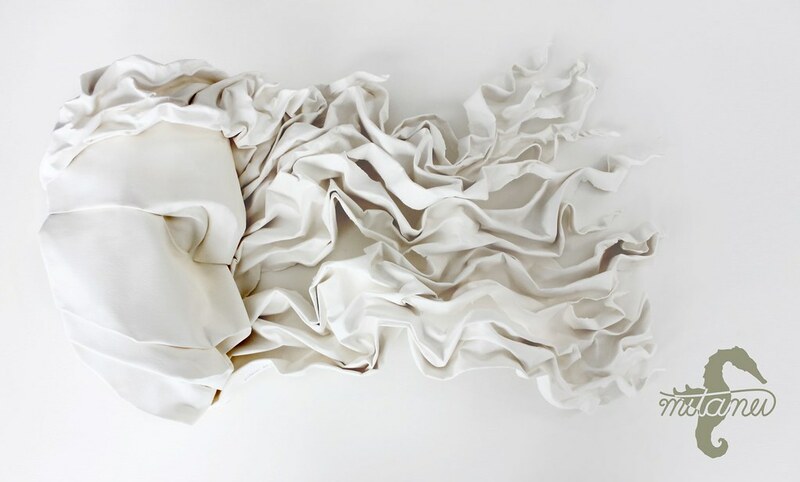 Inspired by nature Folded with recycled cotton paper from Moinho. This is the second version of a dancing bridal pair I made as a comission for a wedding present. 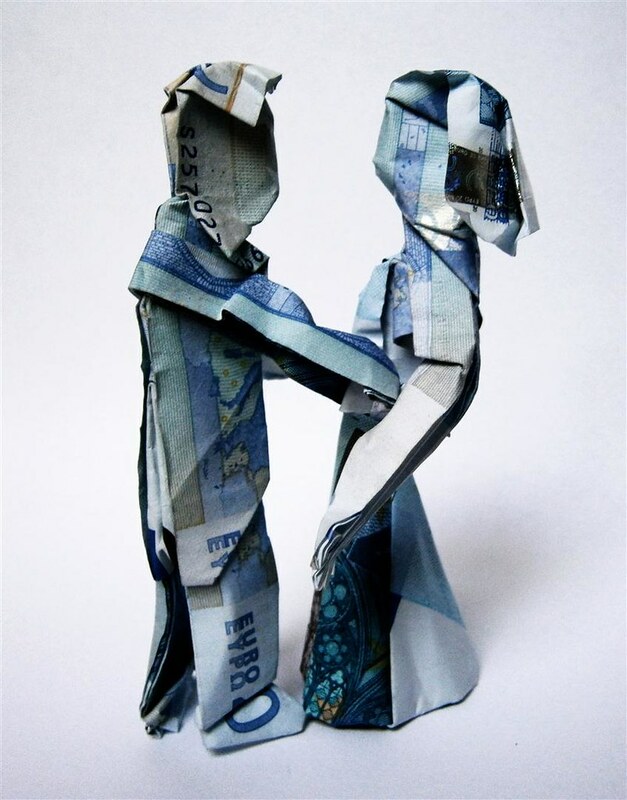 The bride and the groom were folded out of three (new) five Euro bills each. I did a complete redesign compared to the first version. No glue, no cuts. Can also be folded with any other kind of bills as long as the aspect ratio of the bills is approximately 2:1. 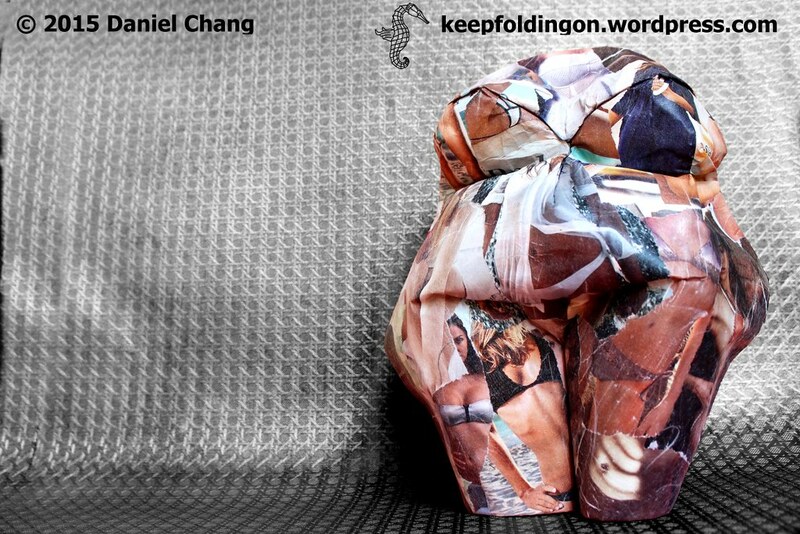 Folded by me. Design by me. My brother asked me to fold something out of money as a wedding present for a friend. 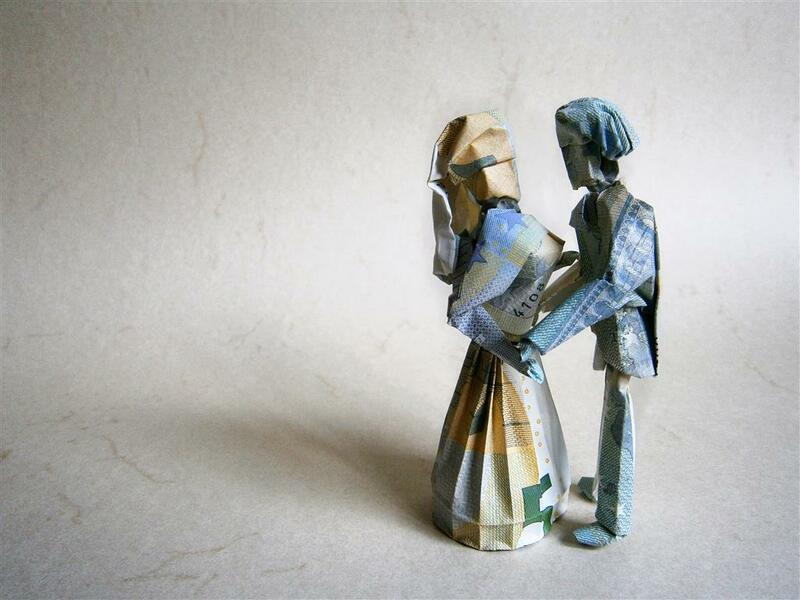 Each figure is made out of three bills. It was a bit tricky to find the right locks for the seperate bills. 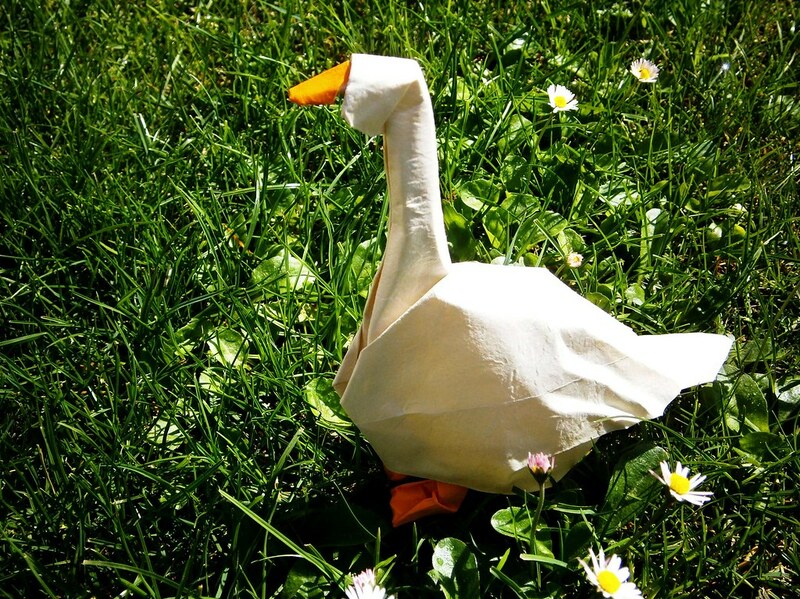 Here is a goose I folded from the traditional fish base. Wet-Folded from an uncut square of 20 x 20cm Iwahada paper. Design by me inspired by nature. I was trying to create a gorilla from the traditional fish base but wasn't very pleased with the outocme. This version uses a modified fish base. 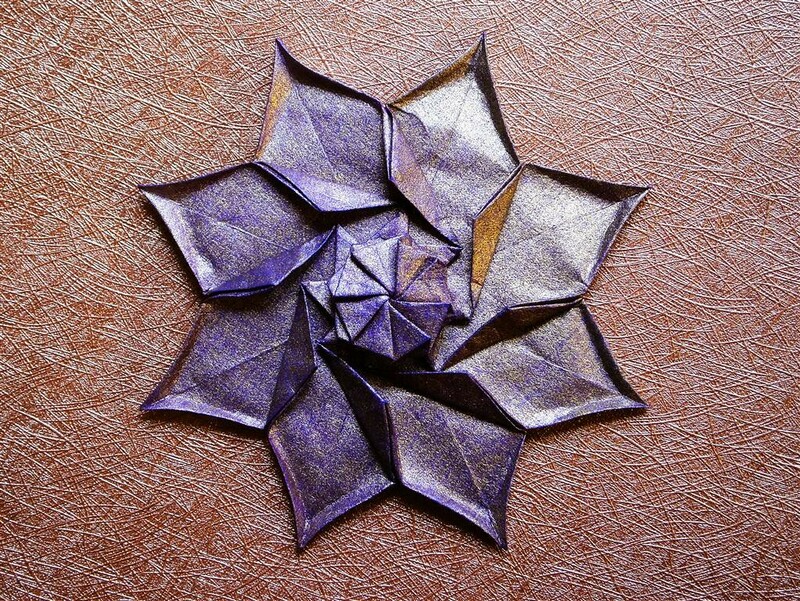 Wet-Folded froma square of 20 x 20cm Iwahada paper. Treated with mc afterwards. Design by me. Inspiration by nature. I was trying to create a gorilla from the traditional fish base but wasn't very pleased with the outocme. This version uses a modified fish base. Wet-Folded from a square of 20 x 20cm Iwahada paper. Treated with mc afterwards. Design by me. Inspiration by nature. 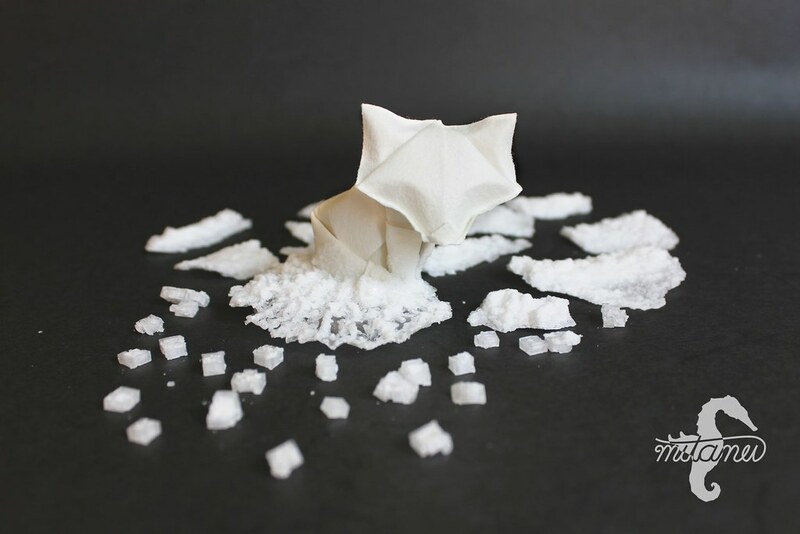 A simple cat, created from the fish base. 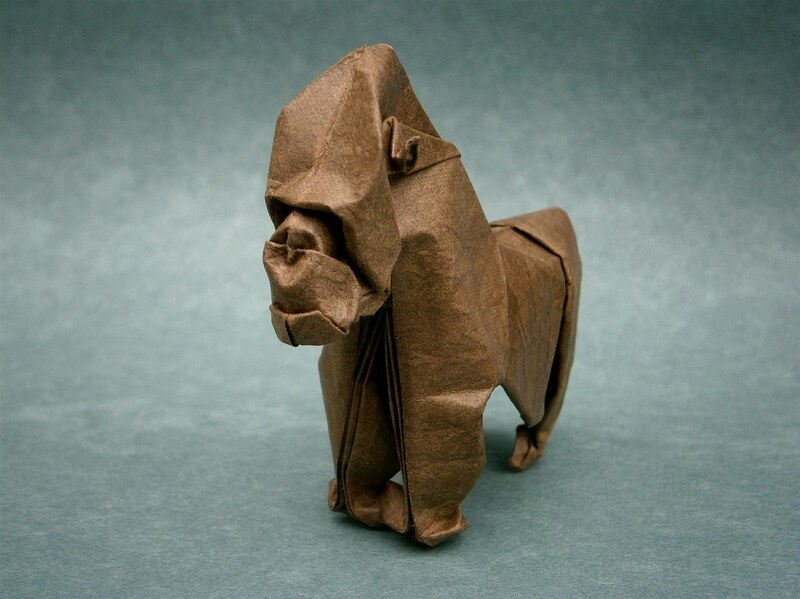 Folded from a square of 24 x 24cm Shiruku Shi paper. Design by me. Ever since I saw Stephan Weber's magnificient bull I wanted to create my own. This is what I came up with after a while of experimenting. Here is another view. 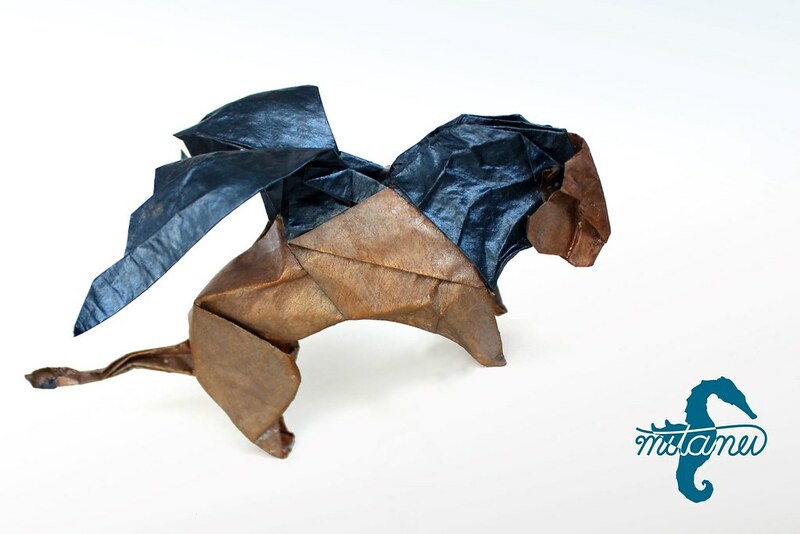 Left: Wet-folded from a square of 50 x 50 cm Elefantenhaut paper. 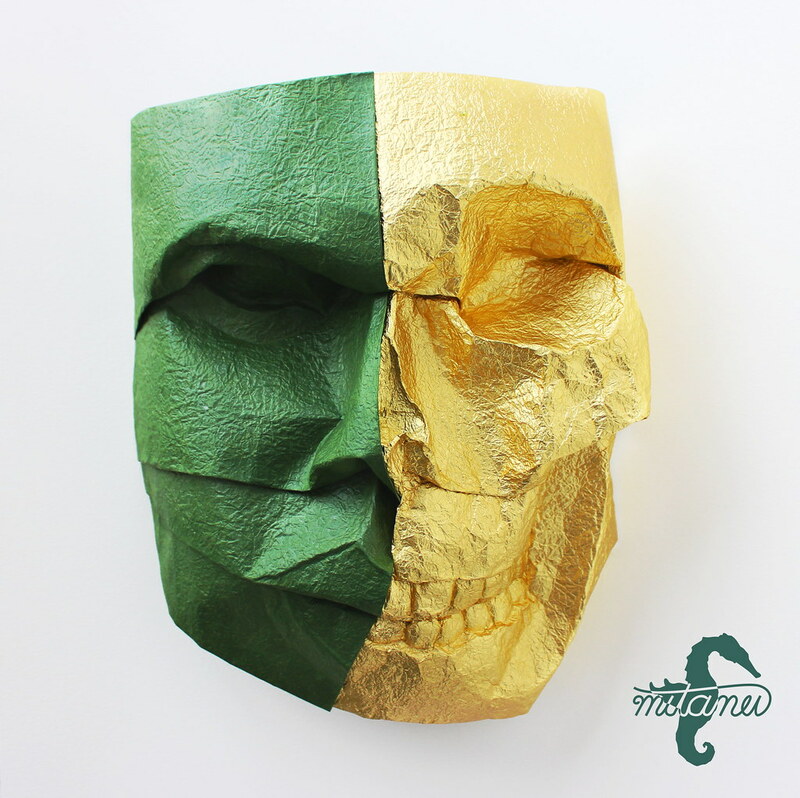 Right: Wet-folded from a square of 50 x 50 cm black construction paper and colored with acrylic paint afterwards. Design by me. 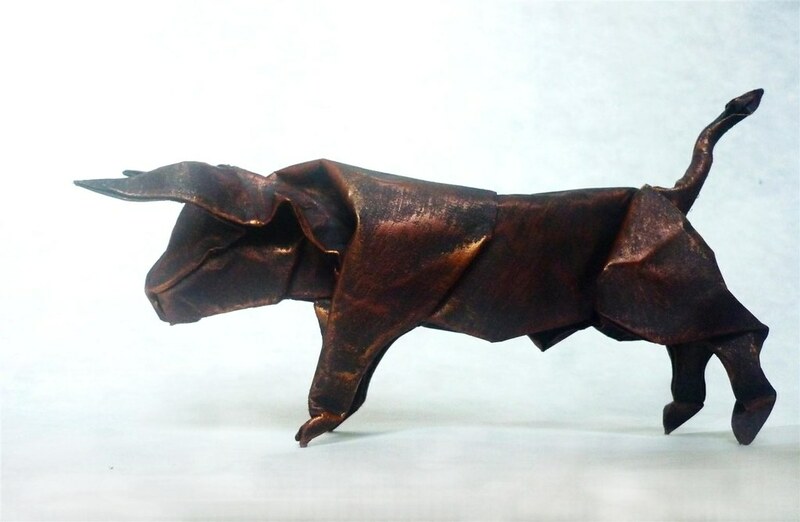 Ever since I saw Stephan Weber's magnificient bull I wanted to create my own. This is what I came up with after a while of experimenting. Here is another view. Wet-folded from a square of 50 x 50 cm black construction paper and colored with acrylic paint afterwards. Design by me. 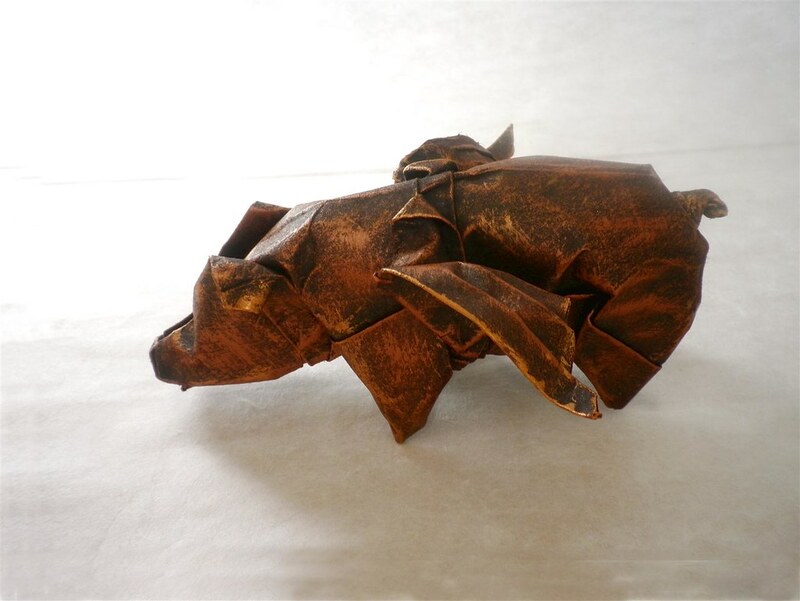 After a while of absence, here is something I folded a couple of days ago. 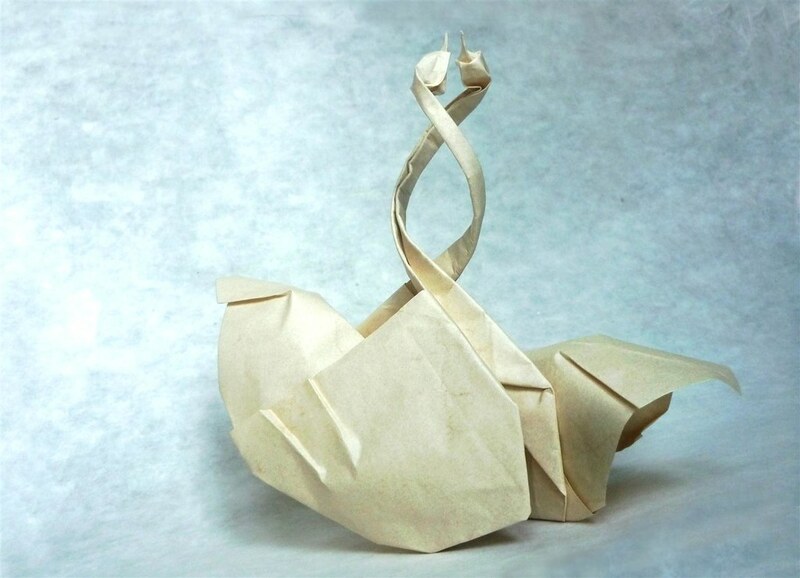 Two dancing swans wet-folded from one square of 50 x 50 cm Elefantenhaut paper. Design by me. After creating a simple pig, it felt just logical to design a flying or winged pig as a next step. 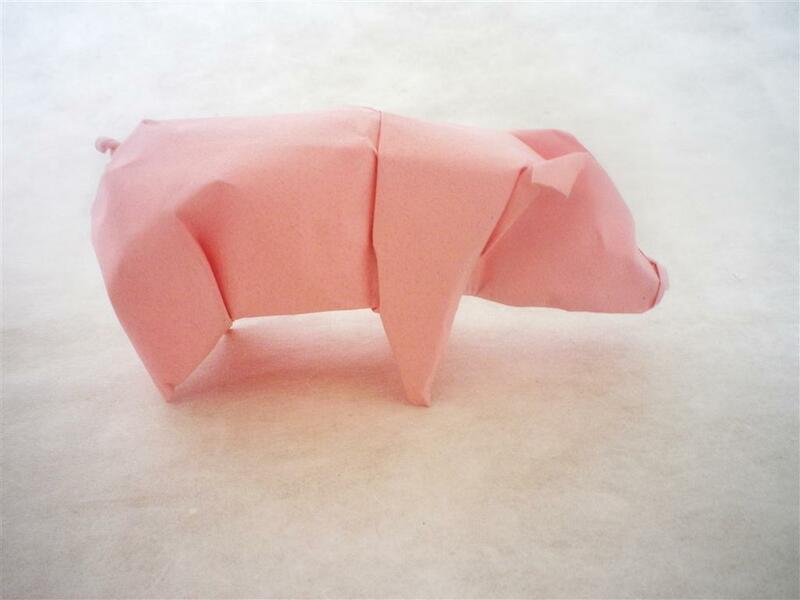 So here is my flying pig model, a modified version of this pig. Wet-folded from a square of 40 x 40 cm Canson paper. 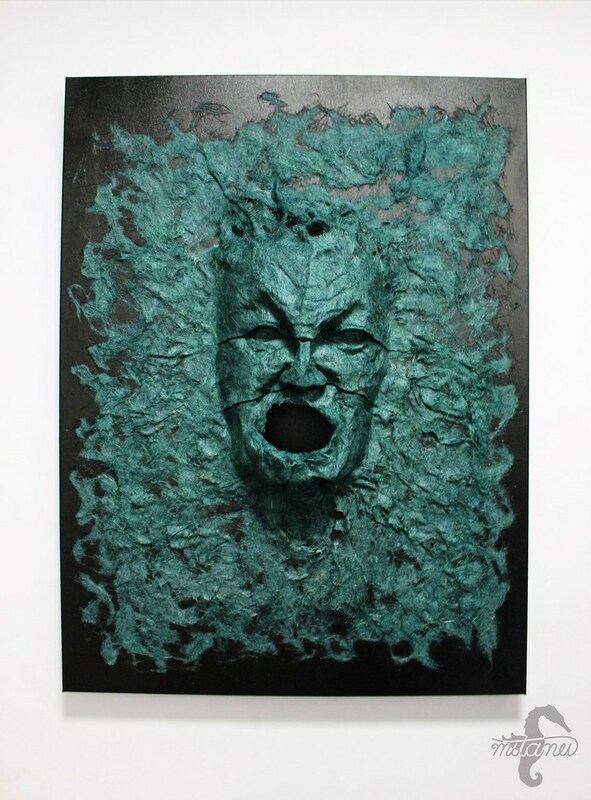 Colored afterwards with bronze and copper acrylic paint. Design by me. The idea for these models came to mind when i saw a stick figure on a warning sign during a train ride. 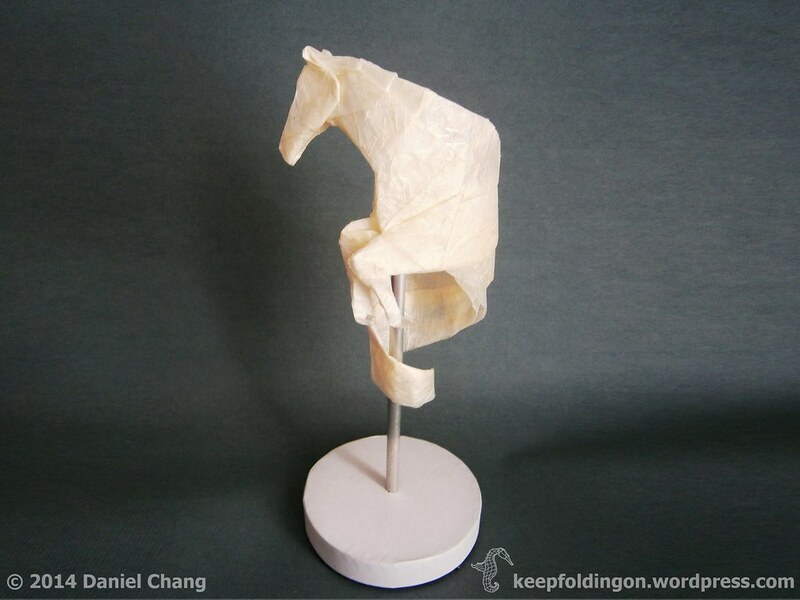 Each folded from a square of 15 x 15 cm tissue foil paper. Design by me. 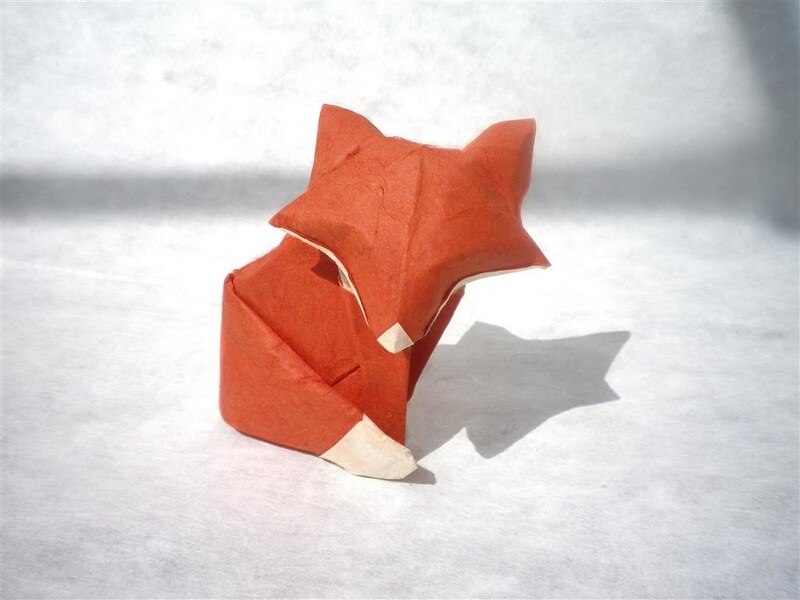 A fox created with the goal of achieving a simplistic model. 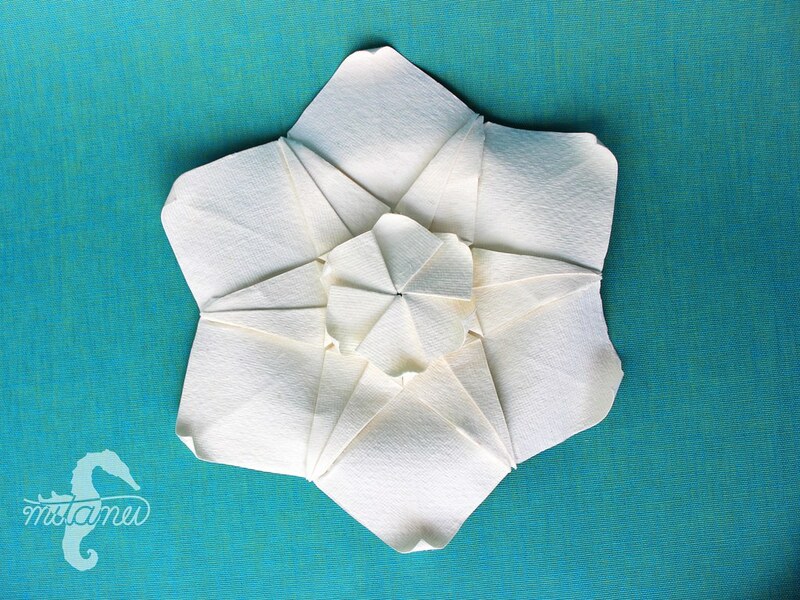 Wet-folded from a square of 20 x 20 cm hanji paper combined with mc. Folded and designed by me. 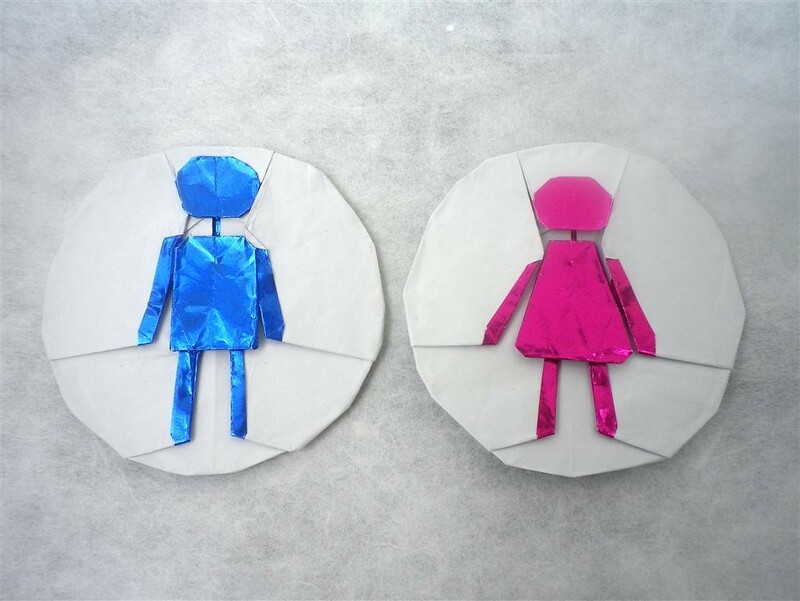 Update: Here is the link for the folding instructions. Many thanks to Marc Sky who made the diagram. 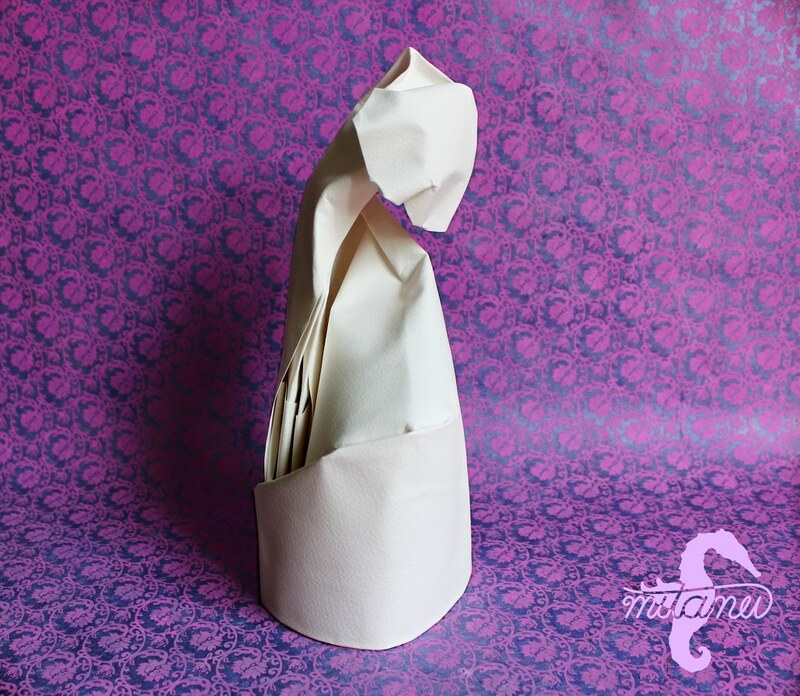 I created this swan for an upcoming wedding of two good friends of mine. 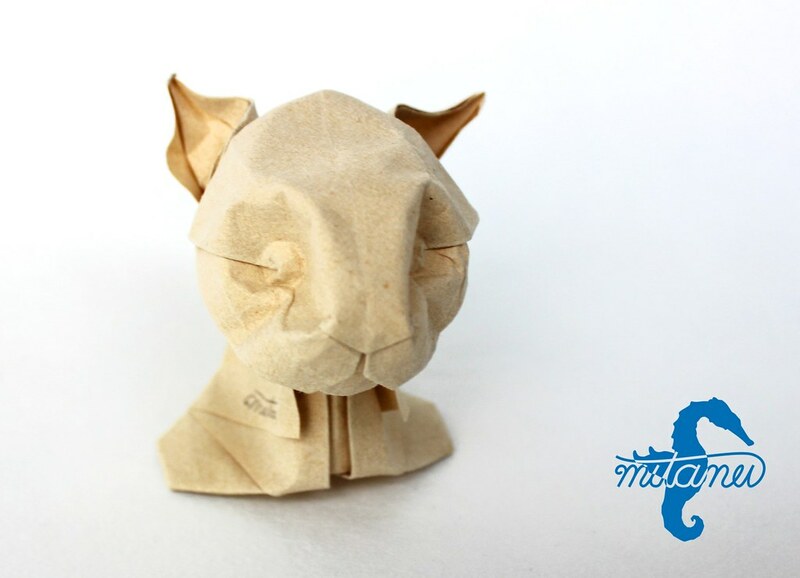 Wet-folded from a 19 x 19 cm square of coined kraft paper. Design by me. 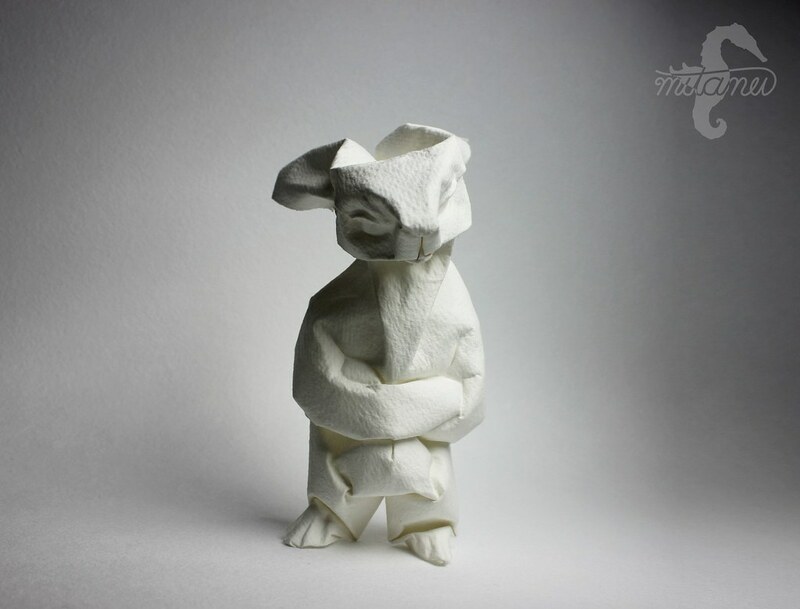 Though i already have two rabbit designs, i decided to create another one for the "Year of the Rabbit". 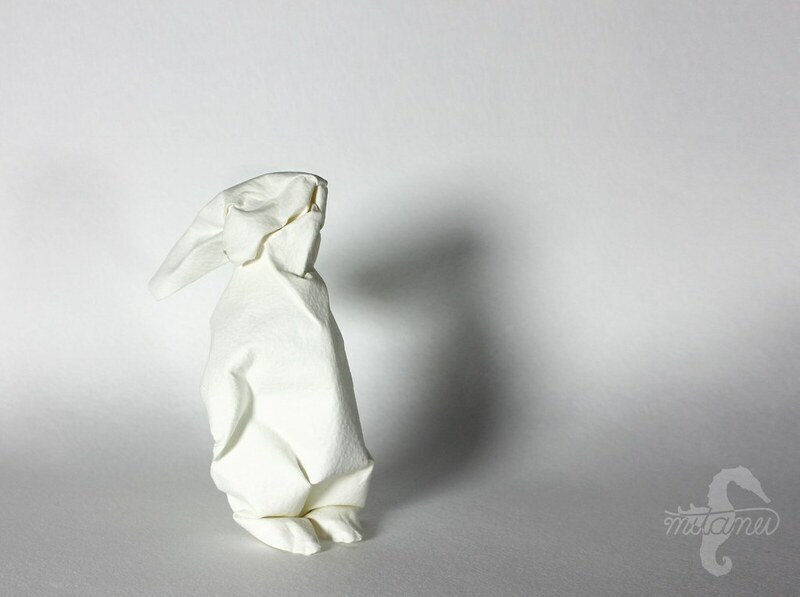 I used the european hare (Lepus europaeus) as a draft for this model. 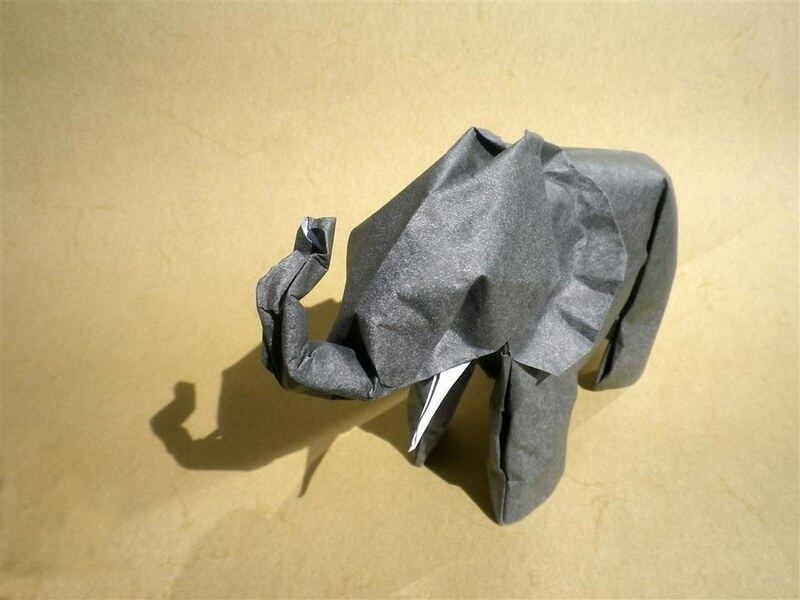 Folded from a square of 20 x 20 cm "Elefantenhaut" Design by me. 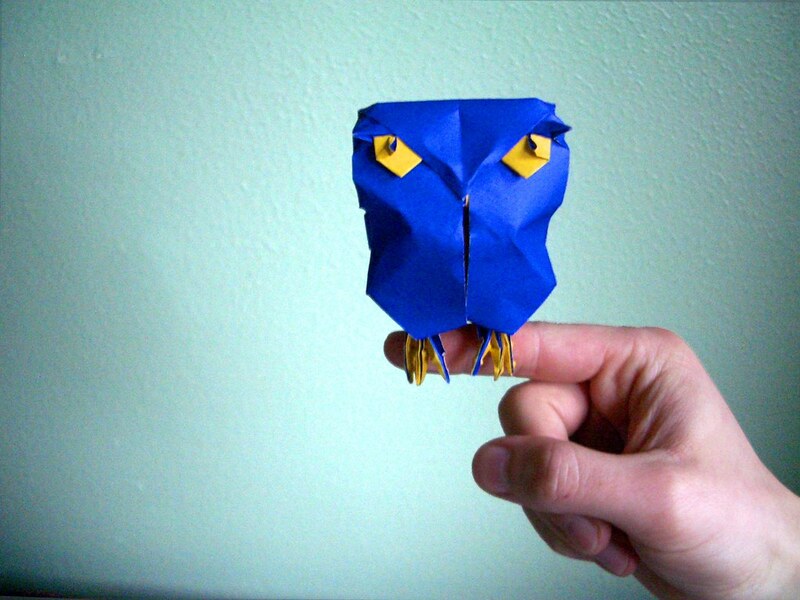 Lately i was trying to design my own owl. The most important part for me was to bring out the eyes. I wasn't aiming for realism so this model too looks a bit more cartoonish. Doesn't she look curious? 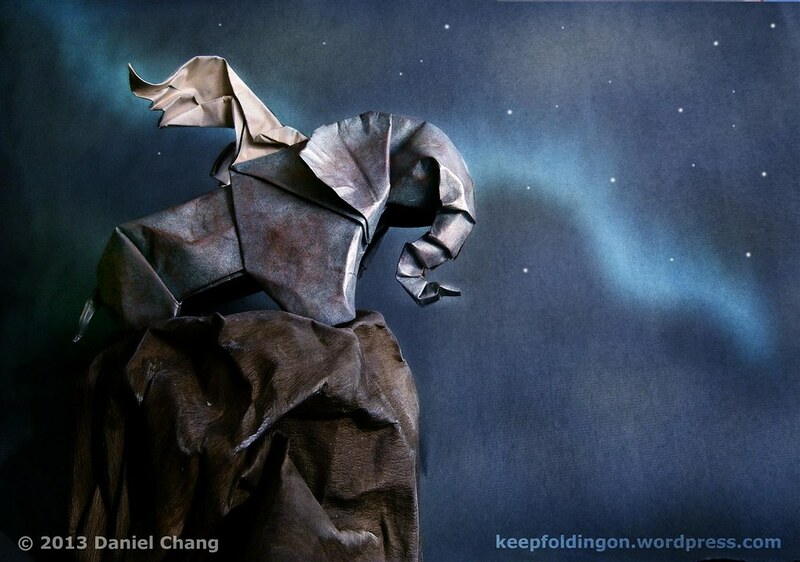 Folded from a 24 x 24 cm double-colored origamipaper. Design by me. I was trying around a bit with cartoon features and came up with this. Folded from a square of 24 x 24 cm double-colored origami paper. Design by me. Doesn't he look like he would kill for a carrot? 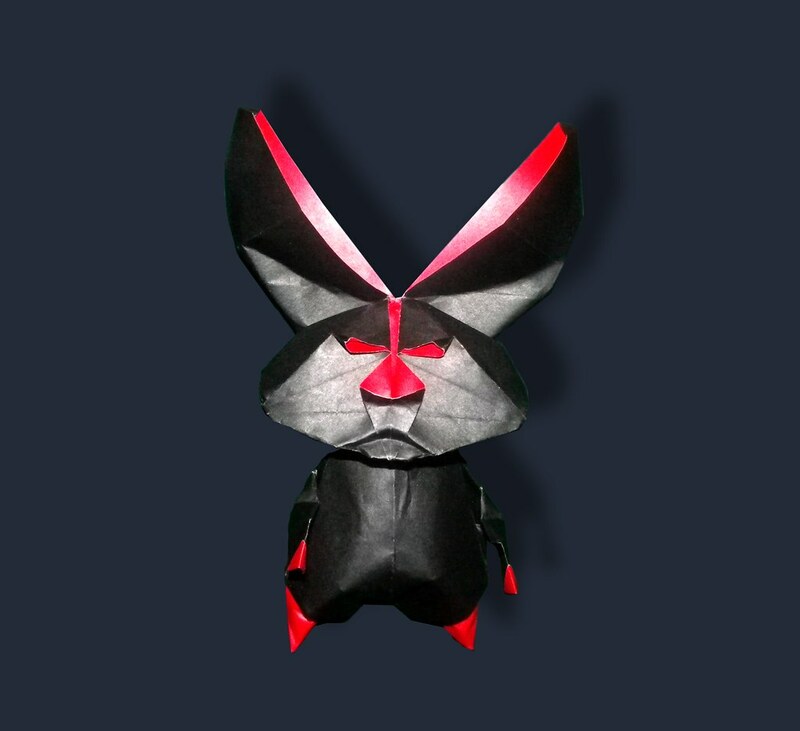 I made this comic rabbit with a similar base as my first one, but it turned out quite different. Folded from a square of 25 x 25 cm double-colored origami paper. Designed by me. 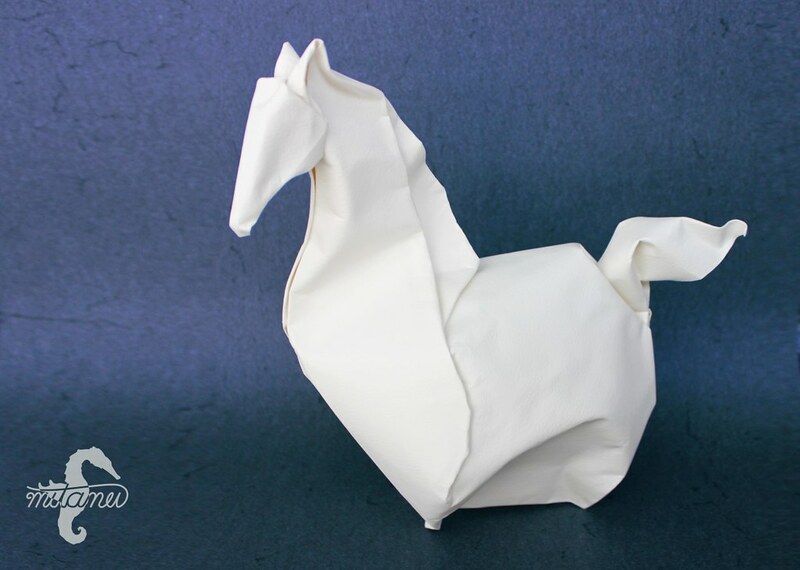 This is my second horse design, folded from a square of 7,5 x 7,5 origami paper. Second version of my donkey. I made some small changes with the head and the front legs. 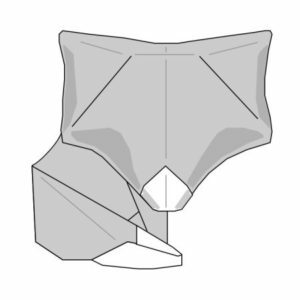 Update: Here is the Crease Pattern for the donkey. Finally finished: Here is the Link to the diagram. 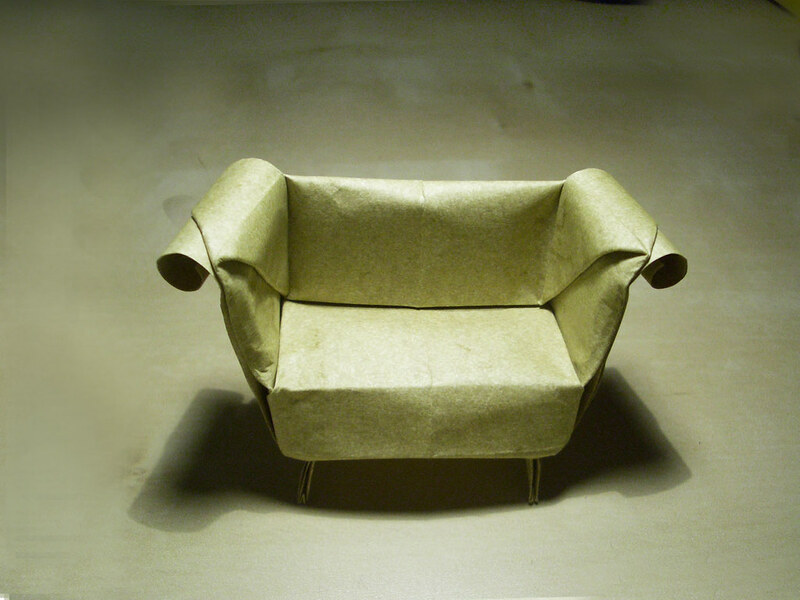 I designed this sofa for a facebook-challenge. 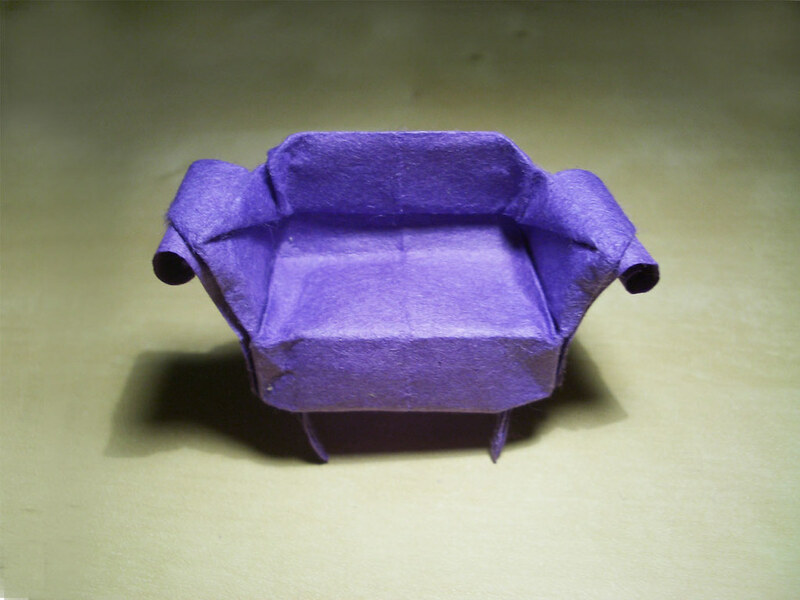 I designed this sofa for a facebook-challenge. 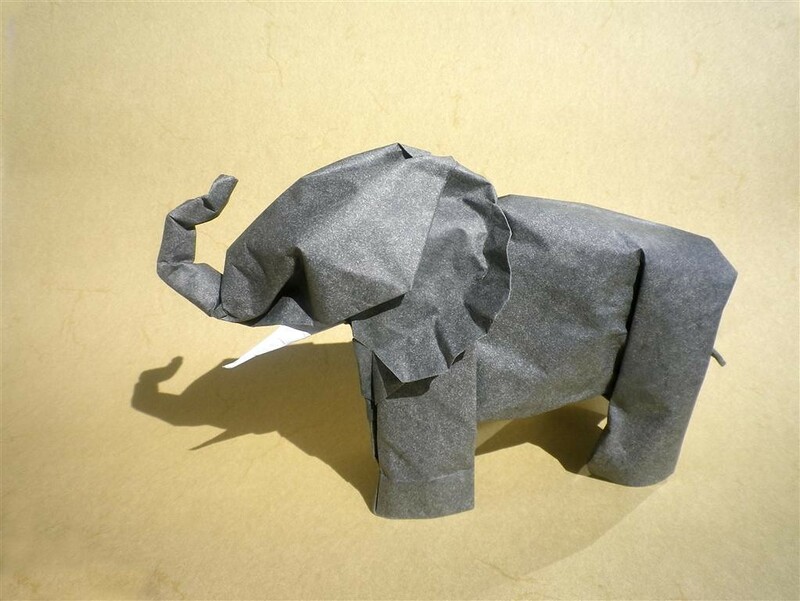 Folded from a 20 x 20 cm paper of elephant-hide. 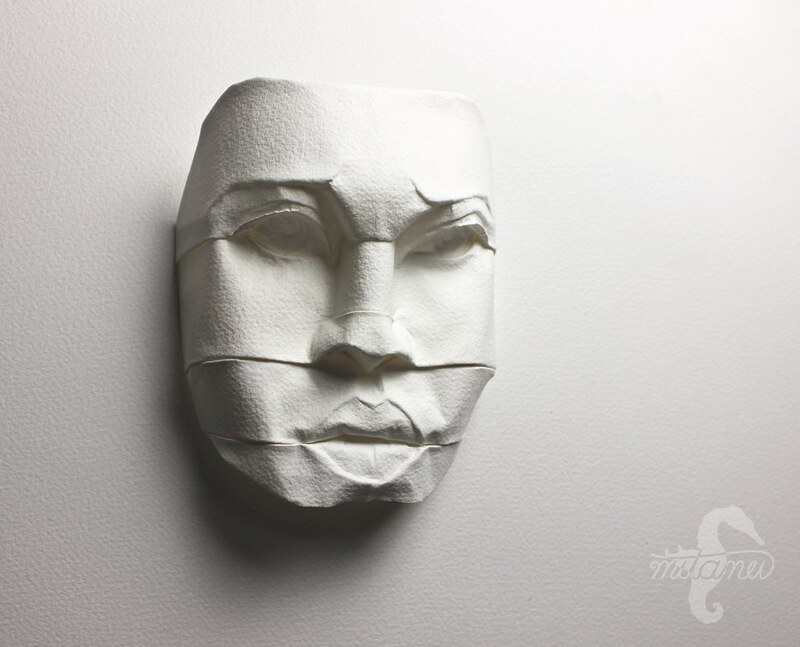 Paper as a material always fascinated me. 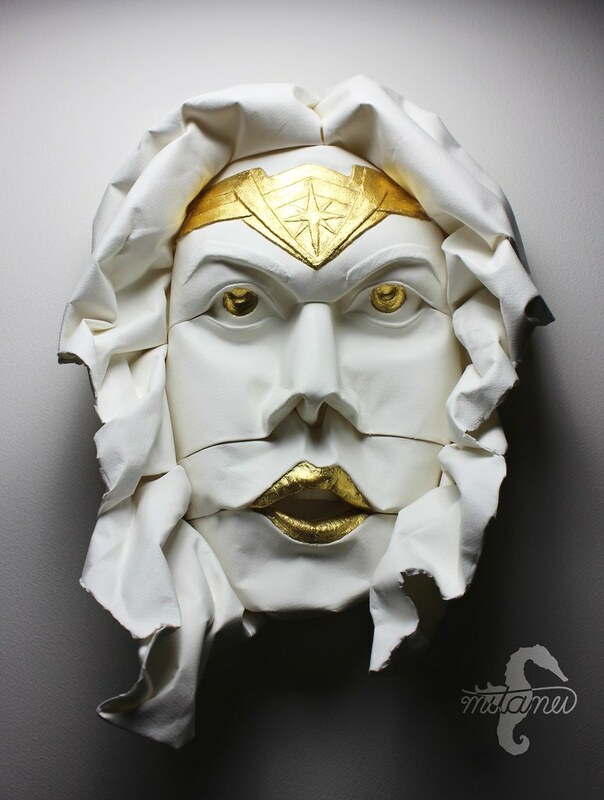 Encouraged by my mother, working with paper was a means to be creative and express myself. 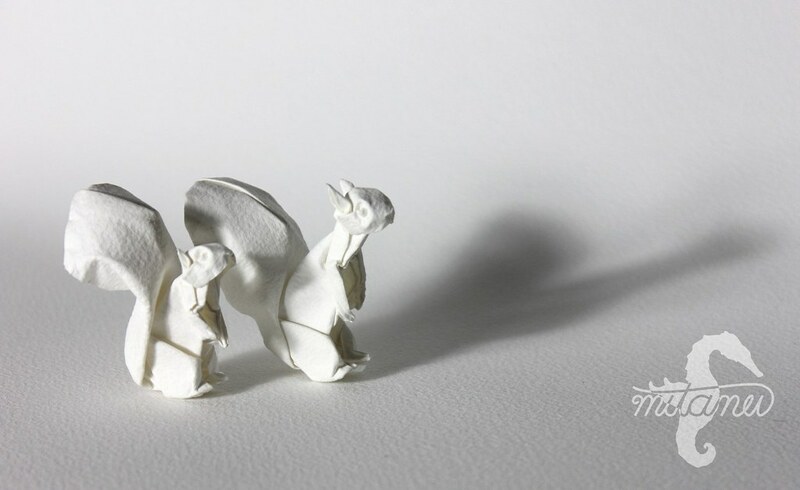 Even now, creating something from a simple piece of paper does have a magical appeal to me. 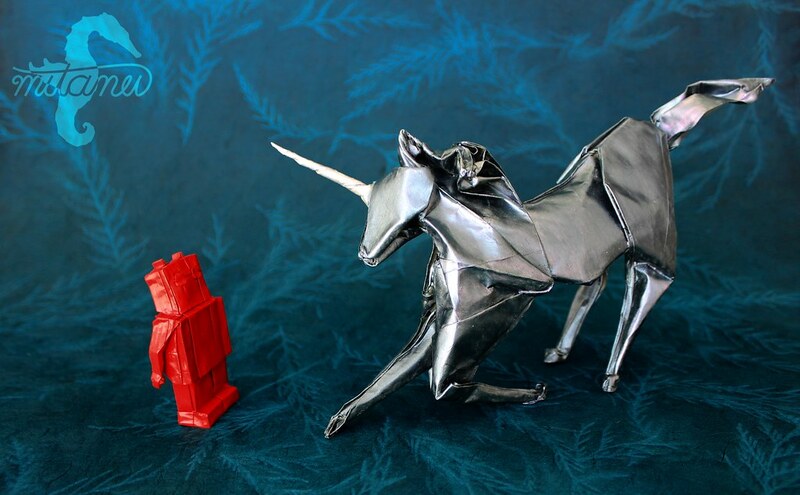 More so with Origami as it seemingly limits the possibilities to create. 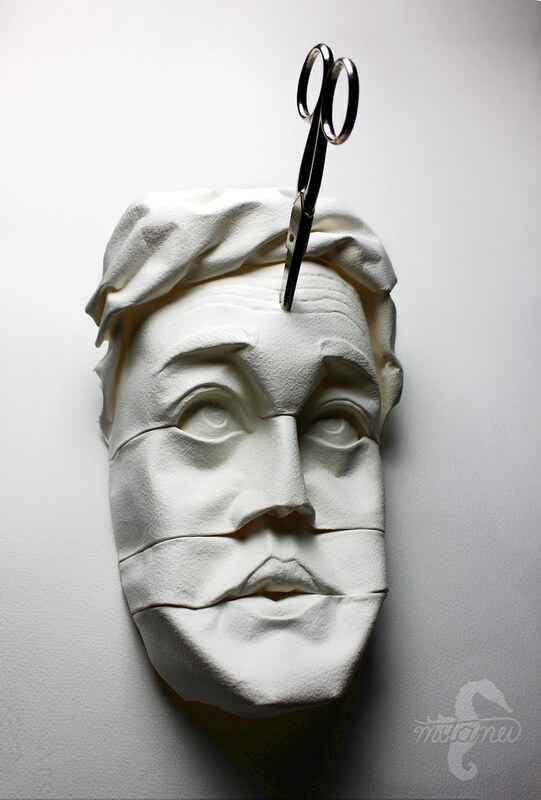 Over the years my approach to create artworks with paper has changed gradually. 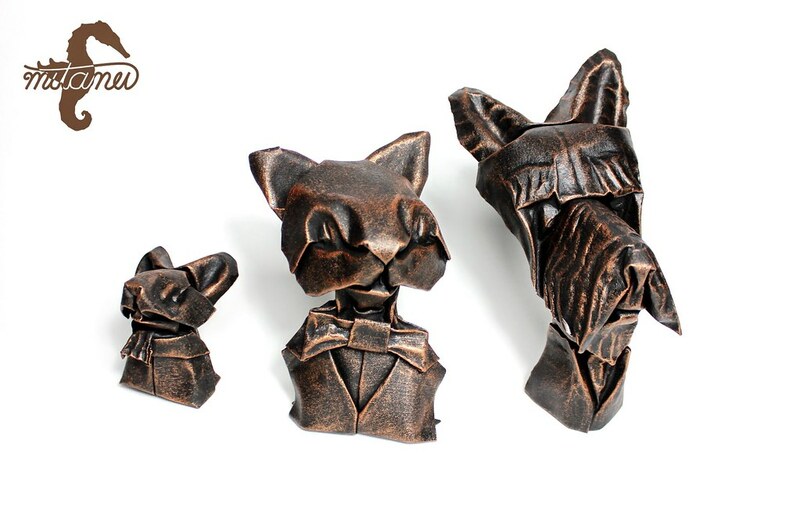 Rather than just folding paper animals I want to create sculptures with character and emotions that will provoke and inspire people to create stories of their own. 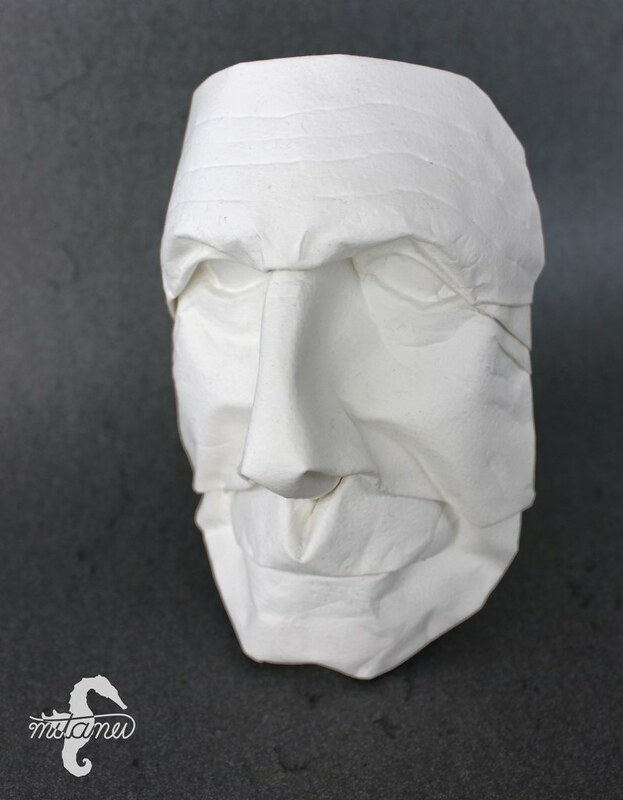 To do so I use heavy watercolor paper with a rough surface that I wet-fold and sculpt which results in a more organic almost stone-like appearance that has similarities to classical sculptures.